Whether you live in a small cottage, a huge mansion, or a bungalow; the kitchen is the heart of any home! Having a perfect kitchen is a dream for many homeowners and, in every home, it will be the place that interests everyone. Many people own beautiful kitchens just for the sake of showcasing it! 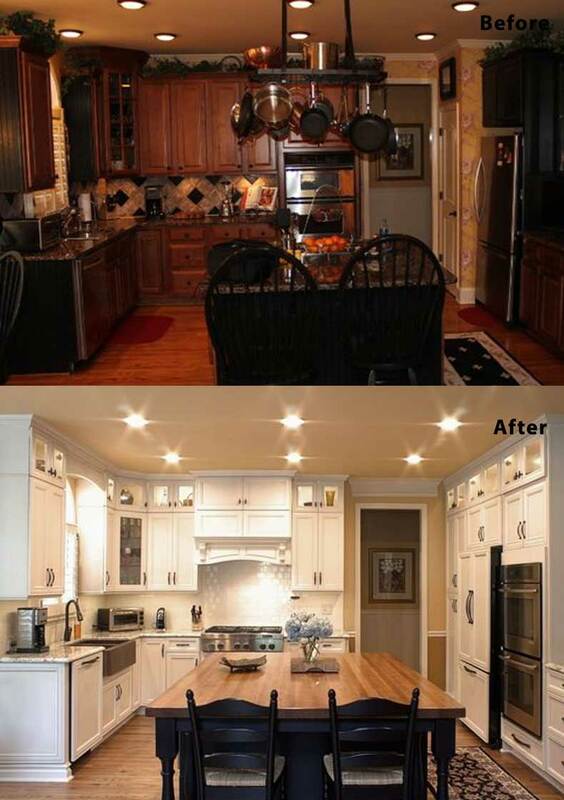 But in today’s house remodeling trend, the kitchen is the most remodeled place in any home. 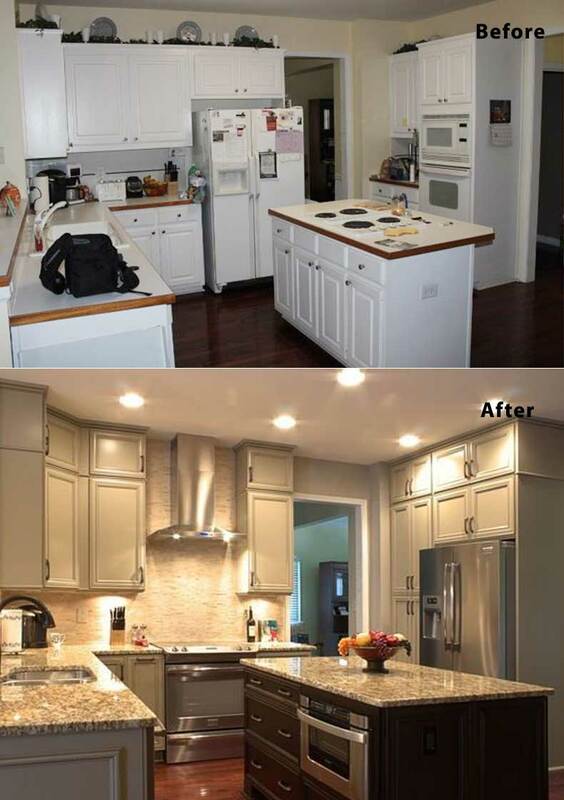 Though it’s a lifestyle choice, remodeling the kitchen will add value to your property. The kitchen acts as a centerpiece of your home! The better you decorate it; the more appealing the house will be. Nowadays, in this busy life, whether you have an interest in cooking or not, having a fully furnished kitchen is a must! 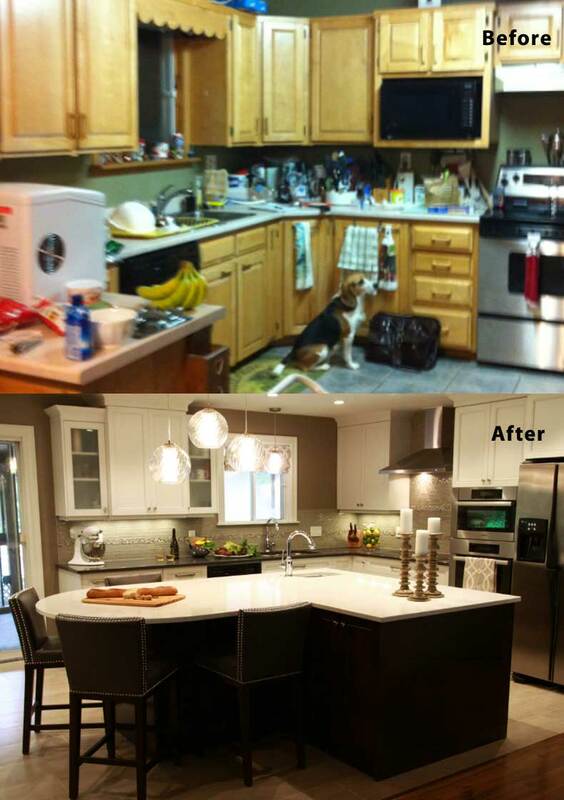 Kitchen remodeling does take a lot of time, money and effort. 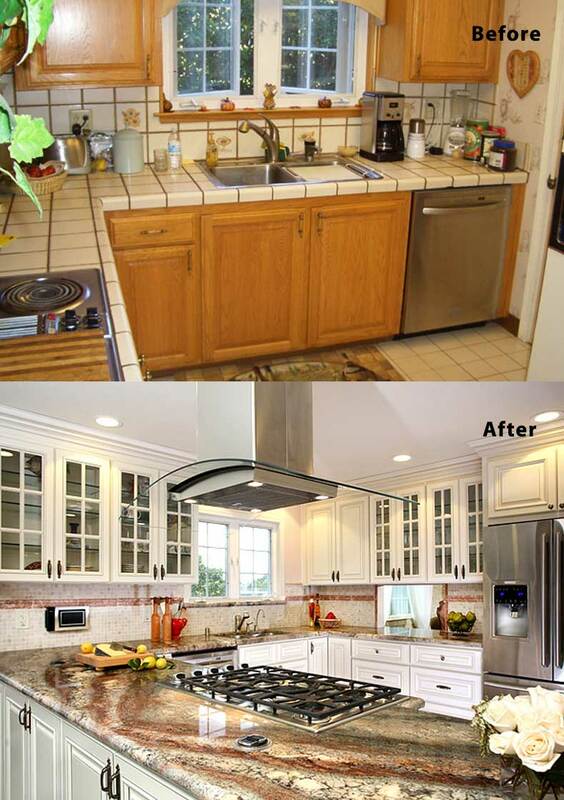 It is always best to know what you want from a remodeled kitchen before you start the renovation process. 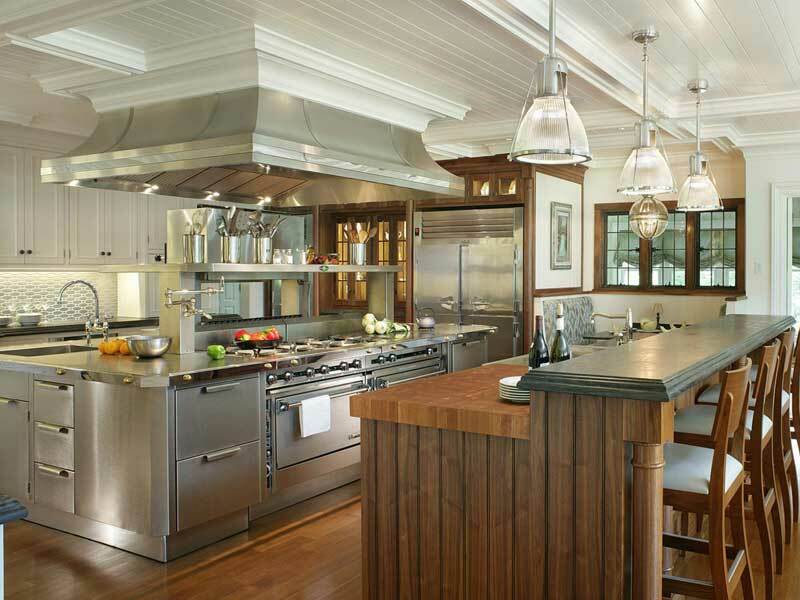 Many kitchen styles are currently fashionable like rustic, farmhouse, traditional and many others. One should be aware of their style as well as the rest of the house as you cannot have a contemporary styled kitchen in a home designed entirely in a rustic way! We have to imagine our kitchen before we even start working on the remodeling, it is then you can have a dream kitchen. Having just an idea about generally improving it will not work. Before jumping on remodeling, it is always best to plan out the process. What is the area size available, how much can you spend and how long will the renovation work take? Who should be your contractor or should it be a DIY, etc. Having all of these things prepared in advance will ease the procedure out a bit while the actual work is going on and even help you stick to your budget. Having said of this, here we have compiled 75 kitchen designs and remodeling ideas for both small and large homes along with pictures, to help you out on deciding the style of your dream kitchen. In this picture, you can see a black and white art deco themed kitchen. The creators of this cozy little kitchen designed it with many small details in mind. The highlight here is the polished Nickel faucets and, also, the black island which adds contrast to the white color scheme of the kitchen. Also, the shiny backsplash at the cooking spot is very eye catching. Perfect kitchen with bright highlights like the dramatic looks they created by adding that gorgeous round and small black stained lights. These kinds of lights are best suited for kitchens with low ceilings. The entire color scheme used here is just perfect. With creamy white counter tops and the mixed color backsplash, the kitchen looks vast and airy. 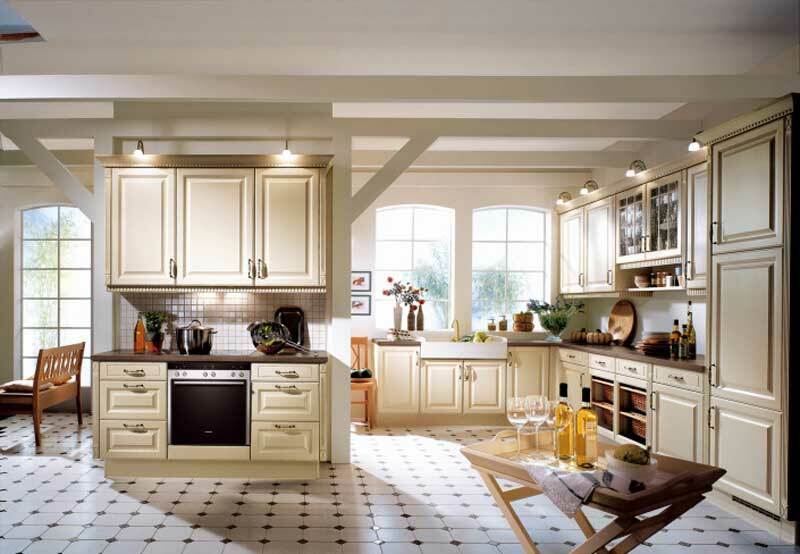 This traditionally styled kitchen looks amazing with the use of the cherry and white color combination. That classic appearance itself is worth the effort of remodeling! To highlight this more, the light shades used on the island is beautiful and trendy. 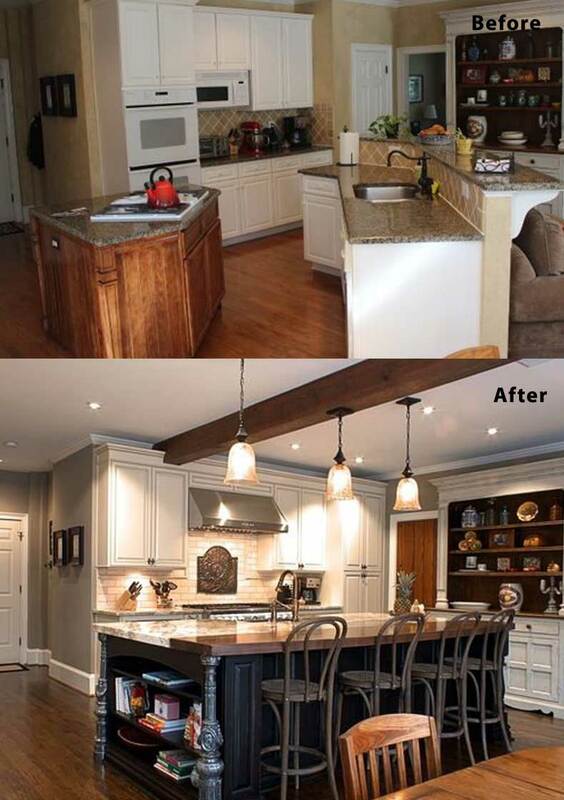 In this kitchen, the lighting fixtures add more essence and creates this wow look! 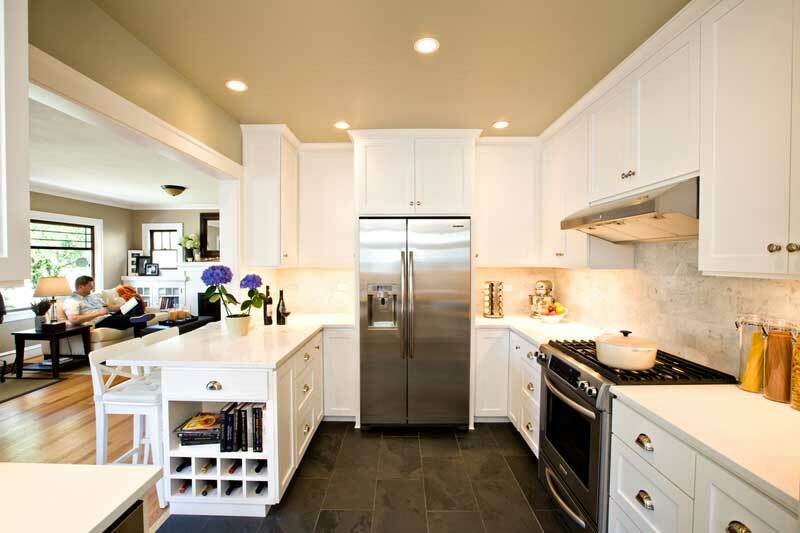 Also, another highlight is the mix and match of cabinets colors which balances the look. An all white classy craftsman’s design, this is a compact kitchen suitable for a smaller area, but you can make a place for everything in the available space. Despite it being a smaller kitchen, there is enough room for wine storage, mini dining and storage cabinets. The steel finish of the fridge and oven does a great job at breaking the flow of the all-white color scheme. 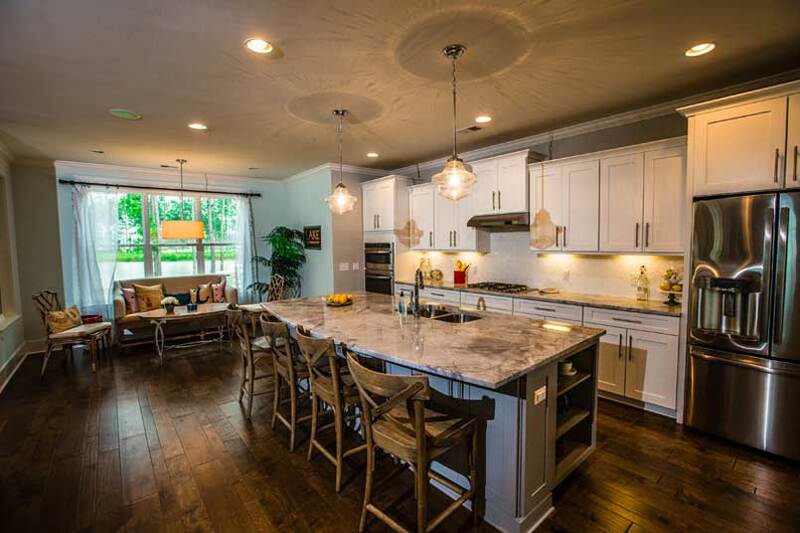 In this beautiful kitchen, the island offers generous seating spaces and a lot of counter top space. The open floor arrangement mirrors the sea coast shading palette and makes a beautiful beach front kind of atmosphere for visitors to appreciate. The highlight here is the usage of the popping sea blue color and also the similarly colored artistic background with highlights. This kitchen has many eye-catching characteristics like the color blue utilized distinctively throughout the place making it look in vogue. The usage of burnt orange wall paint and the exquisite floor and backsplash tiling give the look definition. 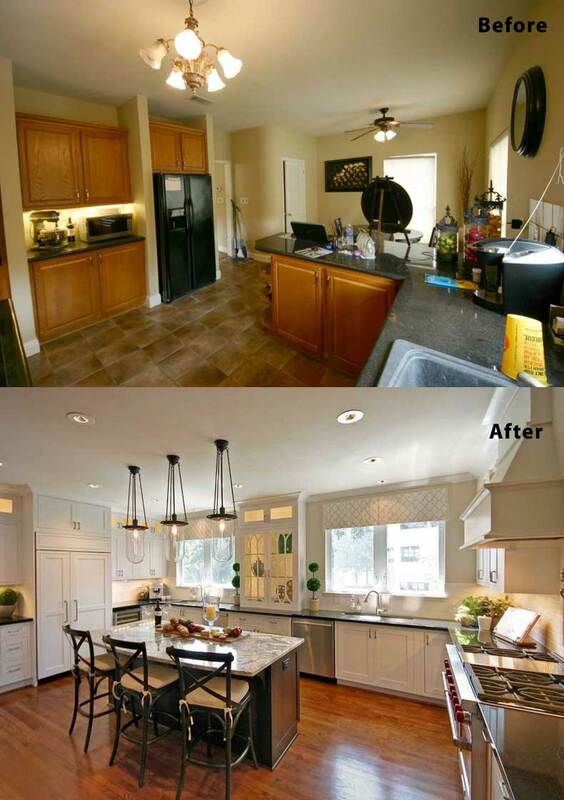 Now and then, little touches are all it takes to make a room feel complete in this exemplary Mediterranean kitchen. 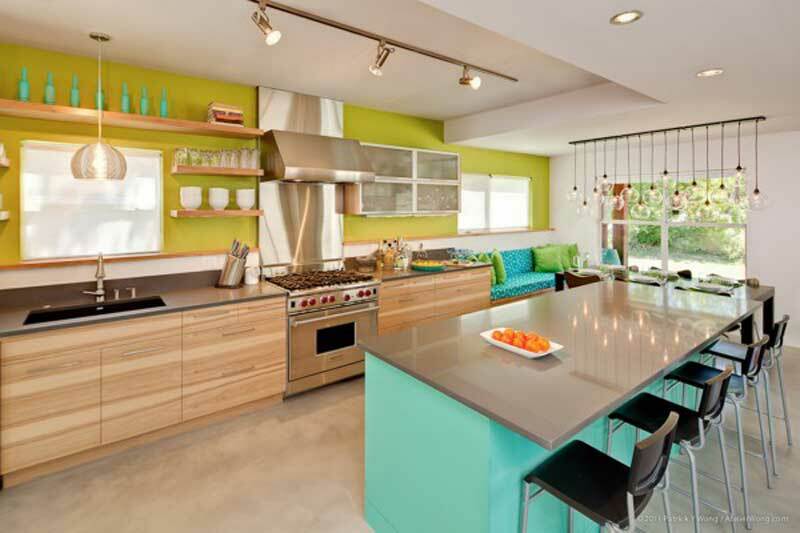 This colorful midcentury kitchen is what everyone would like to have. The sea-blue colored island attracts everyone the instant they see it. To add more color, they included this large olive green background to the counter top which adds even more, highlights. Though it is one of the more colorful kitchens, it is simple in its cabinet designs. This modern kitchen with those pure beige cabinets, the area, looks very spacious and airy. Also, the hanging light makes the high ceiling looks beautiful. Using that unique slide rack next to the oven actually, enhances its look. And it’s not just the looks that make this kitchen great; it also has an abundance of storage space, which is another plus. 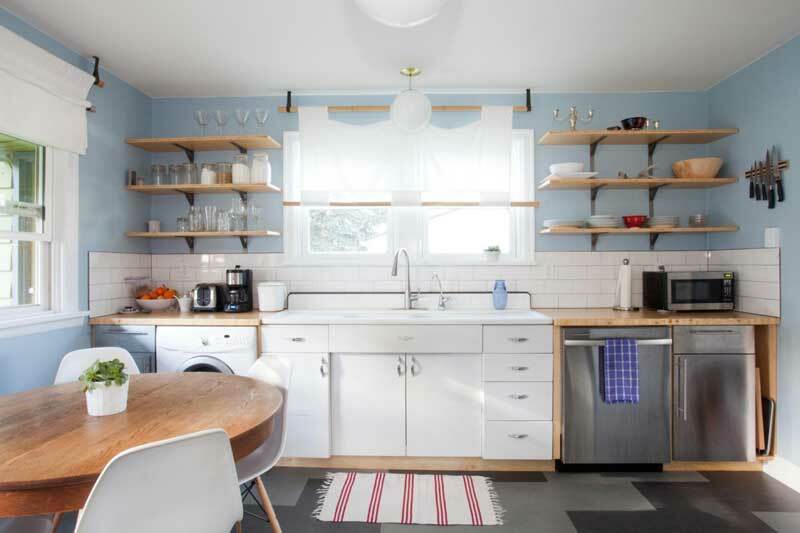 This cottage kitchen is a beautiful setup for those who has space issues. The cream colored cabinets and the vintage-style tiles make this place look spacious. One unique thing here is the extended sink which works perfectly with the setup. The idea of keeping the stove on an island is unique and the backsplash used is easy to clean. 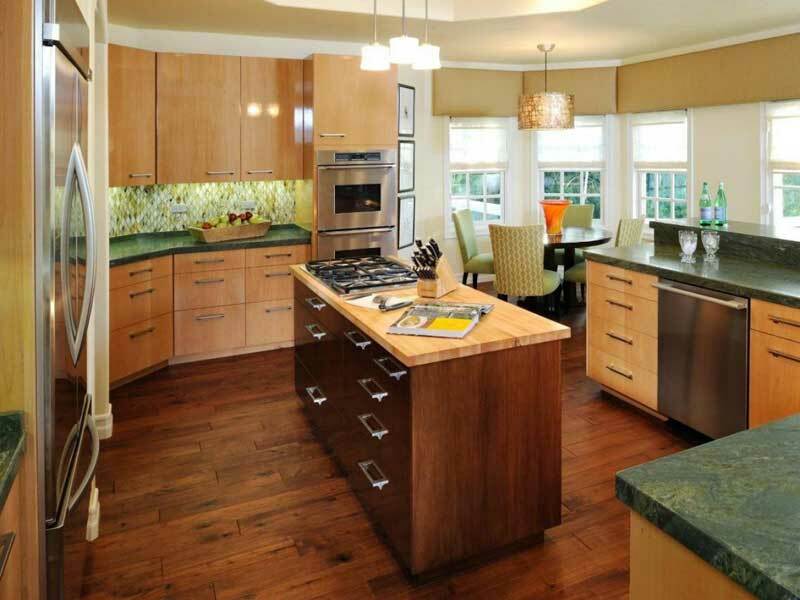 Also, the wood colored counter top enhances the beauty of the kitchen. 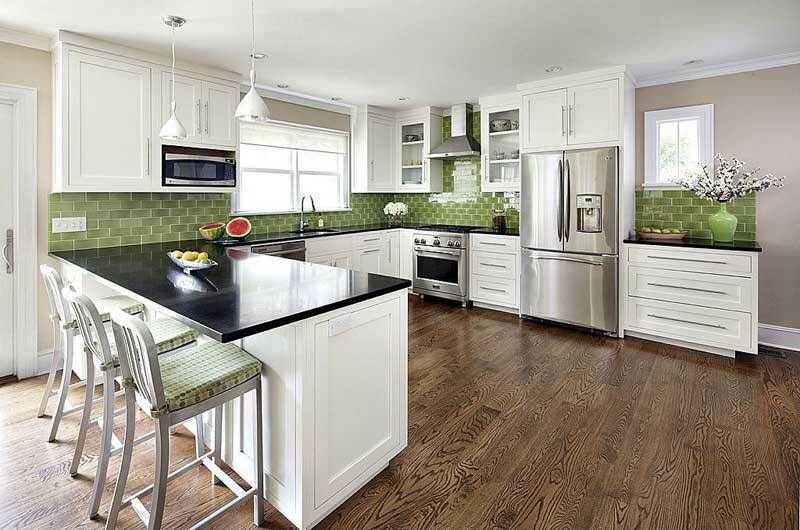 This contemporary styled kitchen has everything you’d want including a pop of green colored cushions! Though simple in design, the kitchen looks elegant with the dark colored wooden floor which complements the marble island. 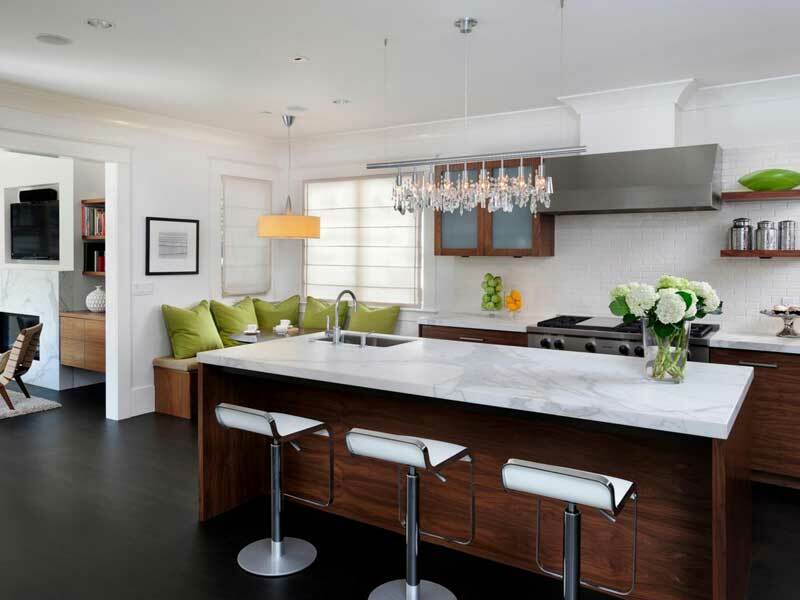 Having a sink in the corner of the island is unique, and that light fixture above the island adds a necessary dramatic effect to the place. Though this kitchen may initially look a little cramped, it is due to the double island it has. With so many cabinets and storage area in these islands, the kitchen looks simply awesome. The black stained marble adds that great aesthetic look to the kitchen. The window design above the stove top is unique. On top of that, the dark floor adds character to the kitchen. This Victorian styled kitchen creates a luxurious atmosphere. With those beautiful white counter tops and matching vintage styled storage spaces, along with an octagonal shaped island, this room is so beautifully done. But that’s not all, the backsplash of the countertop is also very artistic as well. To break the flow of whites they have used black handles for cabinets and a dark colored floor which makes the kitchen look elegant. A simple yet stylish farmhouse kitchen is all we can say about this. 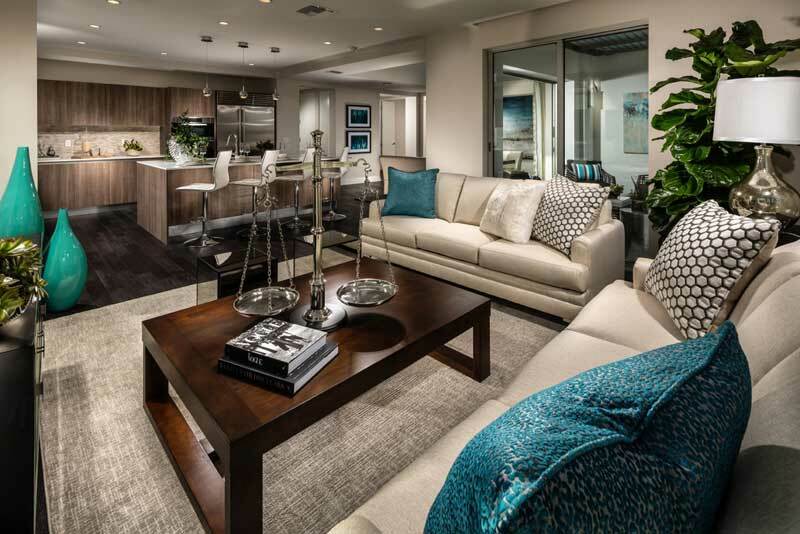 With the available space, they have created a dramatic scene which captures everyone’s eye. 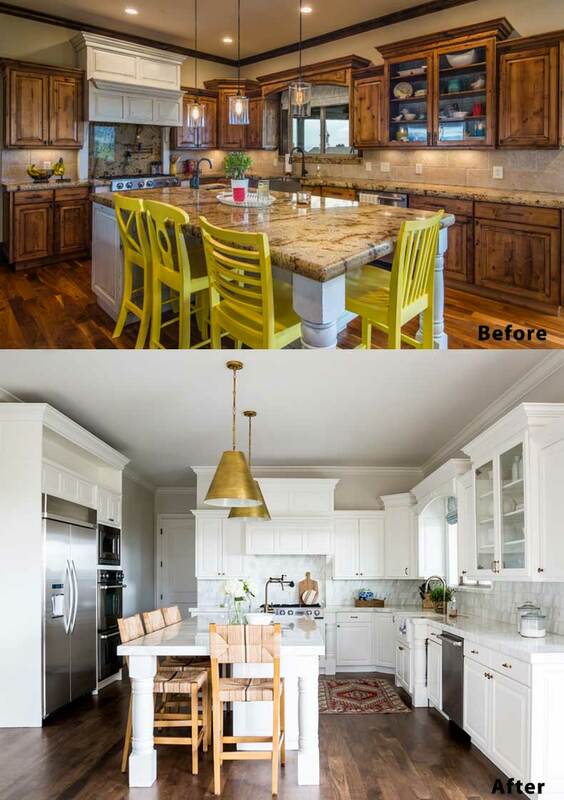 With a light beige counter top, hardwood finished center table, dark colored floor, and dining table to match it; they added a change in the color scheme. The light hanging down itself is an eye catcher. Breathtaking is the only way to describe it. With the vintage style theme, this French country kitchen has nailed the desired aesthetic to the fullest. The faucets, countertop, and light fixture are true vintage style. To add to this, they have used black coated iron handles for all the storage cabinets making it look even more vintage. The table in the middle will surely have many stories to tell. 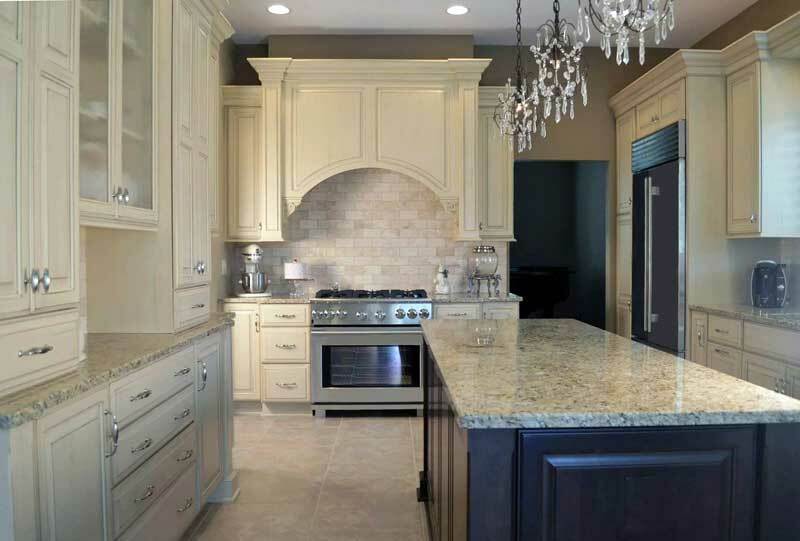 The upper cabinet door design is an old French country style which enhances the concept of this kitchen. When you are really on a space crunch for your dream kitchen, Galley styled kitchens work great with two parallel countertops. It is important to keep space and storage in mind while designing the galley kitchens. 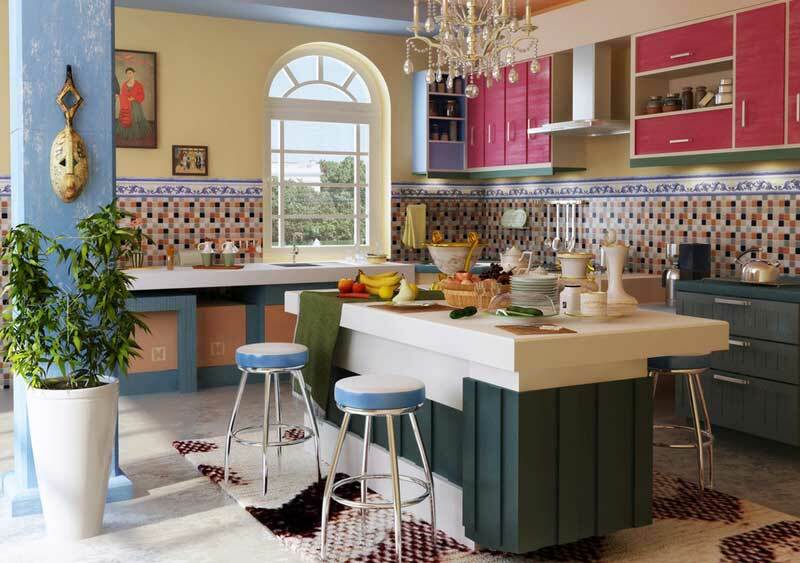 They have planned this kitchen very well with a beautiful view of the dining area and proper color combinations. 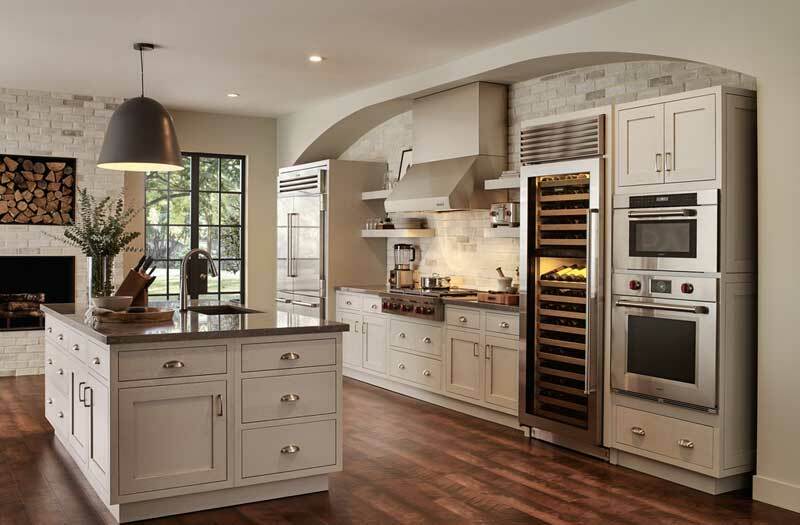 This beautiful gourmet kitchen is full of class and beauty. The beige countertop itself is a piece of attraction. Along with the professional look, the light fixtures are used here to add a character to the kitchen. Everything displayed here though seems very simple; it is a very posh sight to see. Many people love the color scheme of gray-white-black. For those who are looking for a kitchen of that combination, this is a perfect find. The unique dark gray backsplash and the dark gray island top complement each other very well here. The finished wooden floor adds a pop to the whole gray and white theme. A kitchen with a high-end design! The attraction here is the large island with an extra bed to keep dishes. Also, the hanging light fixtures are eye-catching assets. 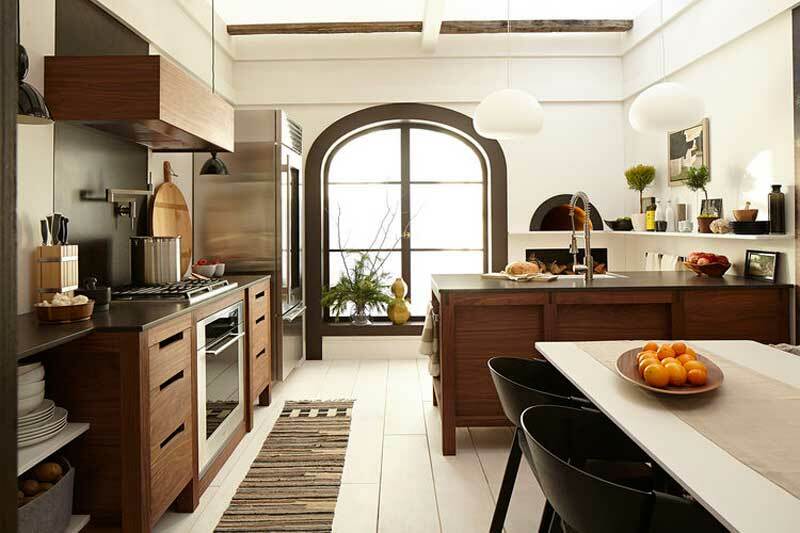 By using a dark brown, burnt orange and white combination, this kitchen is a masterpiece in balancing the colors. Full of utility with a hardwood floor and no flashy items, this kitchen is truly one of a kind. The oak tree island top makes a unique rustic look to the kitchen. 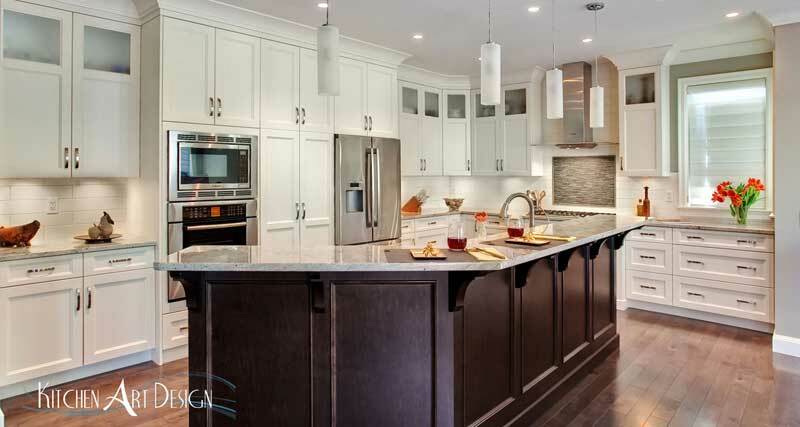 With those maple tree cabinets and custom made hoods, this kitchen is fully equipped and highly functional. 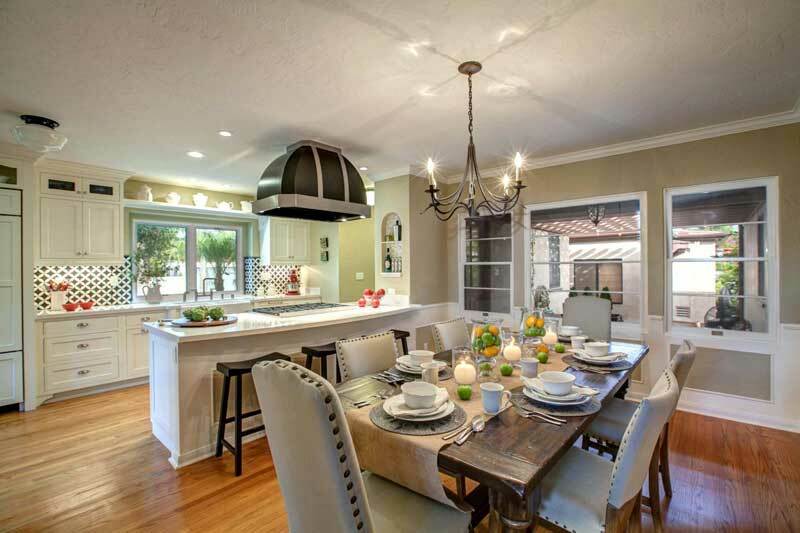 If you have an enormous amount of space, this is the perfect example of merging the dining space with the kitchen. With a European-based design, this kitchen gives the warmth and satisfaction of a happy home. 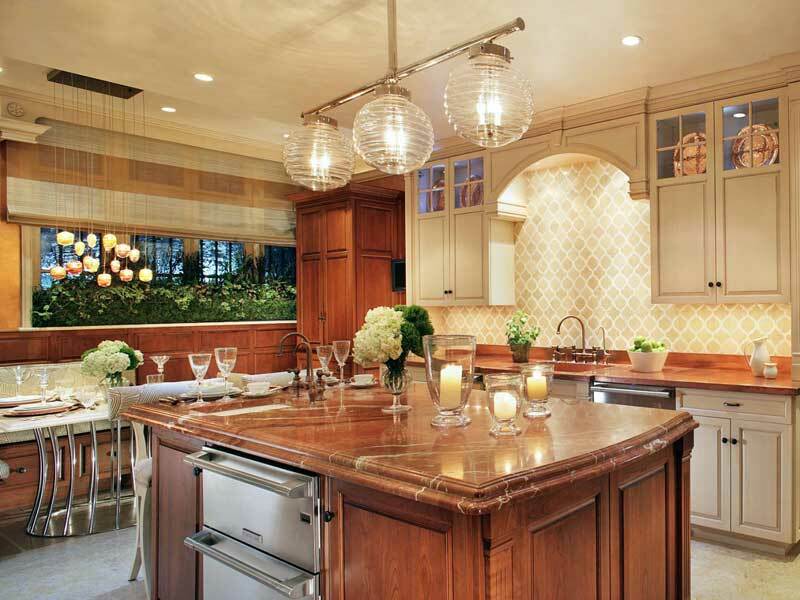 The highlight here is the dome-shaped light fixture and a matching backsplash. Some people love the idea of having a kitchen just open to the living room. They may feel that while cooking, it is easy to converse with the loved ones. This image shows how one can implement this idea aesthetically. The main idea here is to blend the kitchen and living room furnishings so that it won’t look too gaudy and different from each other. 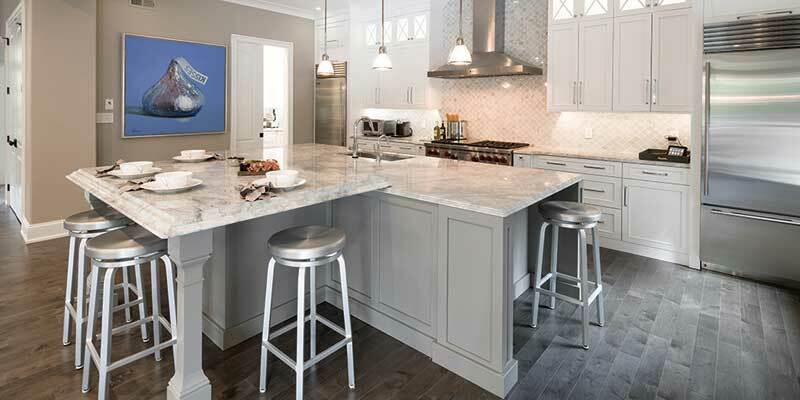 Many people insist on having large kitchen Islands because of the storage space they get beneath, or they spend a lot of time chatting with loved ones while they cook. In the picture above, this idea implemented in a superb way. The eye-catching element here is the back splash and counter top. On the kitchen island, a square butcher ledge makes a distinct preparation area beside the gas stove. 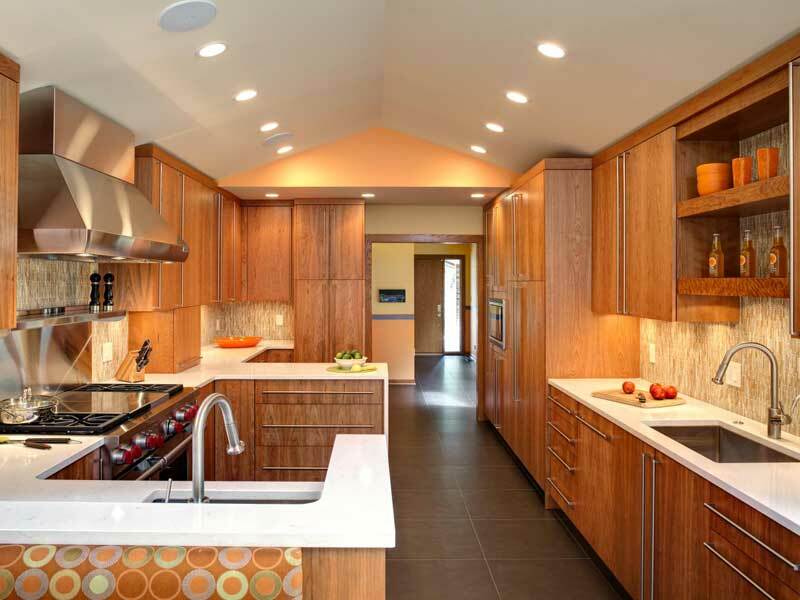 Flat wooden panel cupboards and dark hardwood floors convey warmth and comfort to the open kitchen. This kitchen looks both classy and stylish at the same time. This L-shaped design is an excellent idea for those who has less space with open area. This kind of kitchen design allows free movement. 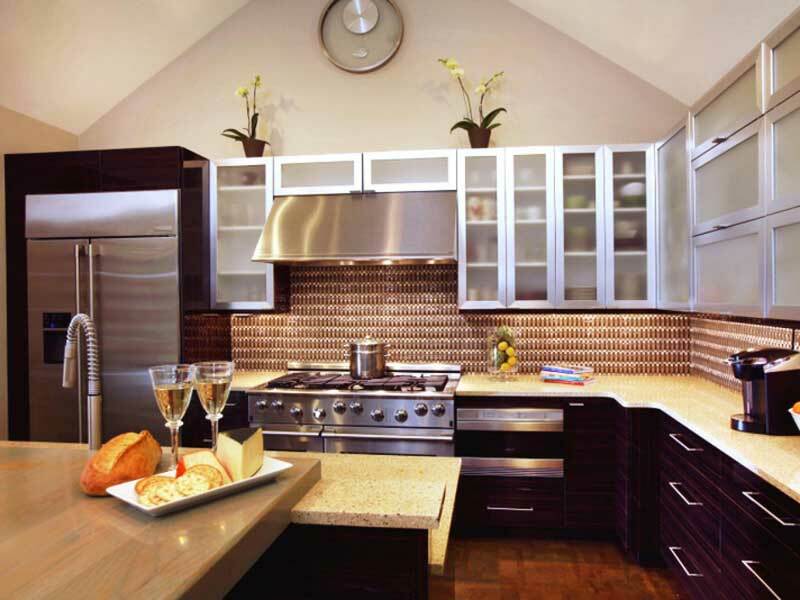 One of the highlights in this kitchen is the glass backsplash. To break the flow of whites, they have used a beautiful hard wooden floor which goes well with the design. The perfect blend of utility and aesthetics is all we can say about this kitchen. The color combination is soothing, and it brings warmth to the atmosphere. 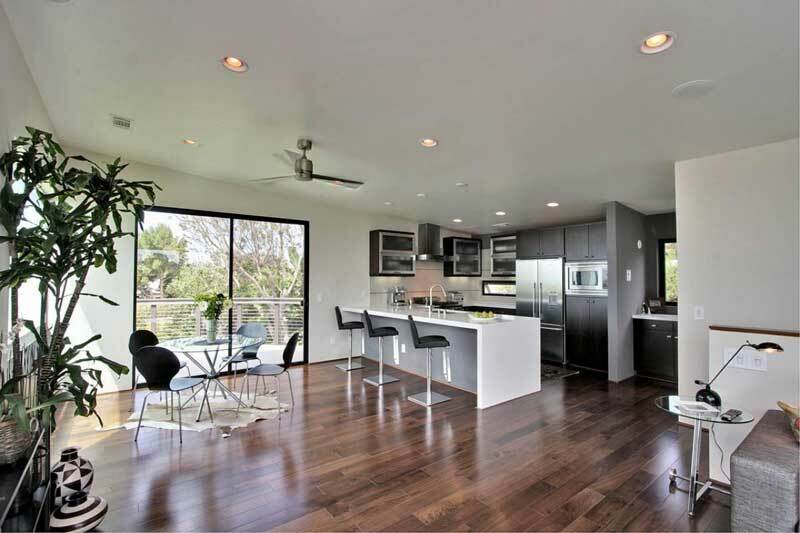 The walnut colored cabinets complement those white colored floor and walls making the kitchen look stunning. 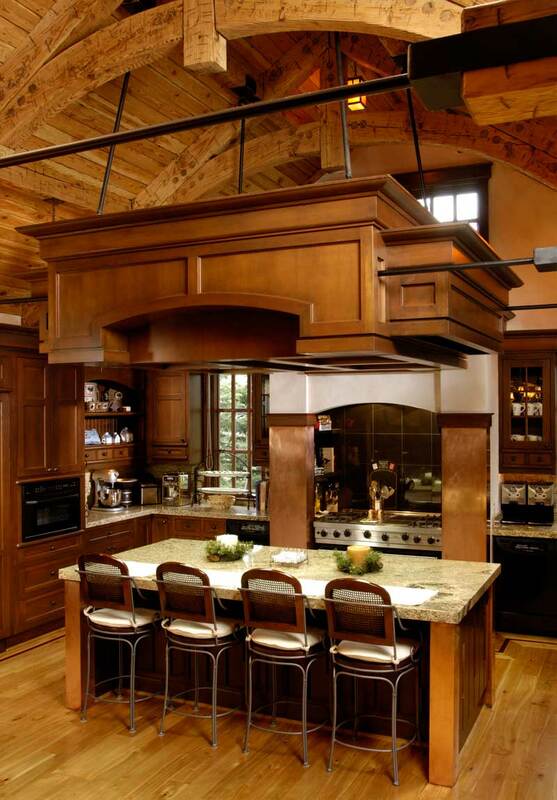 This Tuscan style kitchen offers a cozy, comfortable environment in which everything is in the right place. This design is well-suited those who love a combination of vintage and rustic. One of the unique properties of this kitchen is the finished wooden hood which blends well with the design. 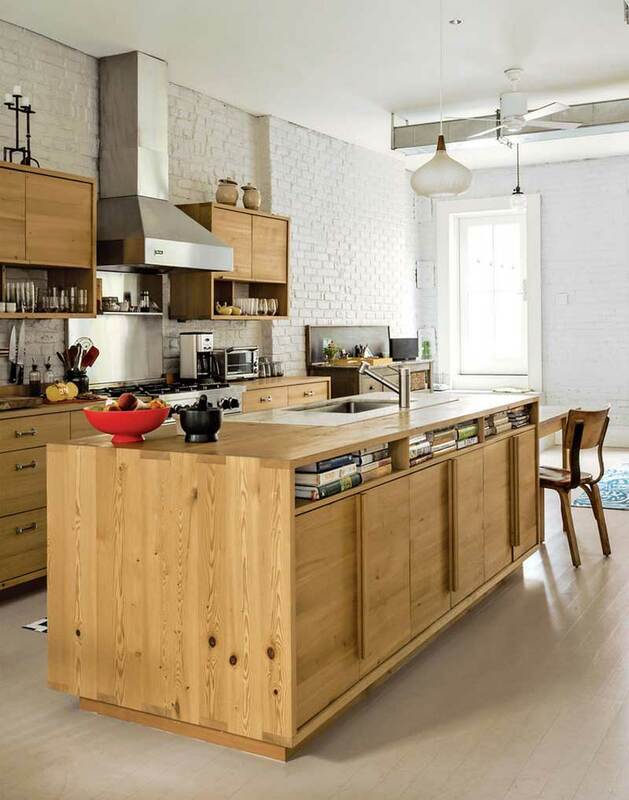 This kitchen is designed well with natural wood which gives the kitchen a unique style. Keeping it simple and utility oriented, this kitchen is suitable for those who are looking for all wooden furnishings for their kitchens. The highlights of the kitchen are the faucets and lighting. This kitchen has many eye catching pieces. The cabinets above the countertop are unique and stylish. Also, the rare combination of backsplash, countertop, and down cabinets attracts visitors. The color of all these three blends in a very strange way. The open storage shelving is a very differest style of storing boxes. The small kitchen looks amazing and easy to construct and is also budget friendly. Sometimes, it becomes very hard to manage this kind of open shelves as dust may accumulate very soon. Many people across the world are willing to have open kitchen nowadays; this is because of the space it consumes. These type of kitchens take much less space and is open to the dining area making it look bigger and more spacious. This style suits those who have limited space well. 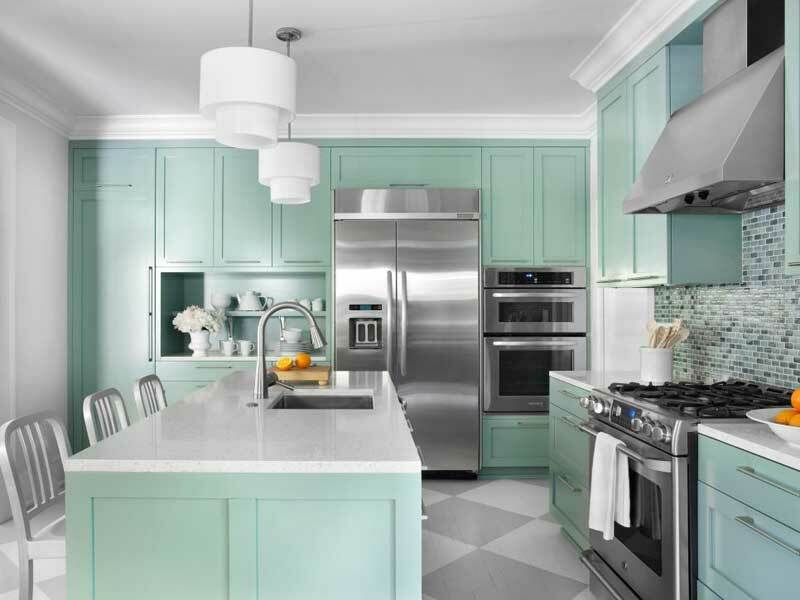 This beautifully light mint colored kitchen design by coordinating with other colors well. The floor and backsplash add that dramatic look to the kitchen. Though the kitchen looks very sober, it is elegant with mild colors. 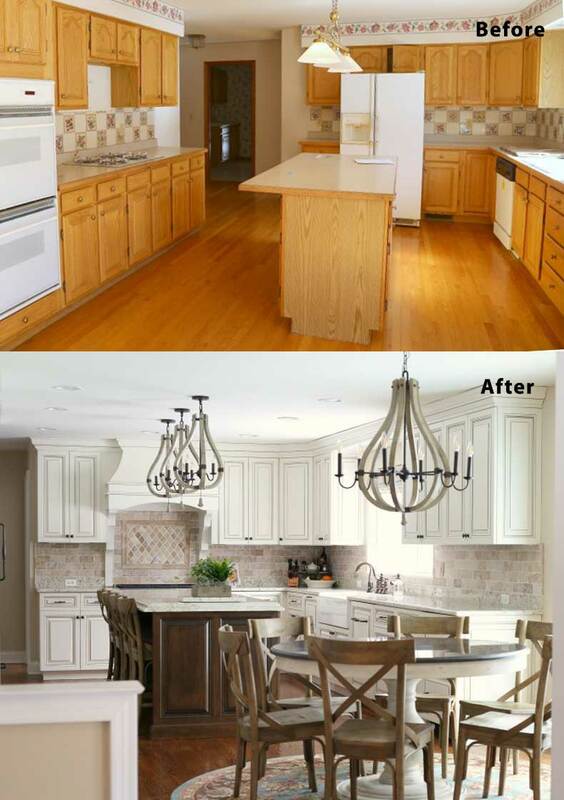 The light fixtures used are also a beautiful addition to this kitchen. 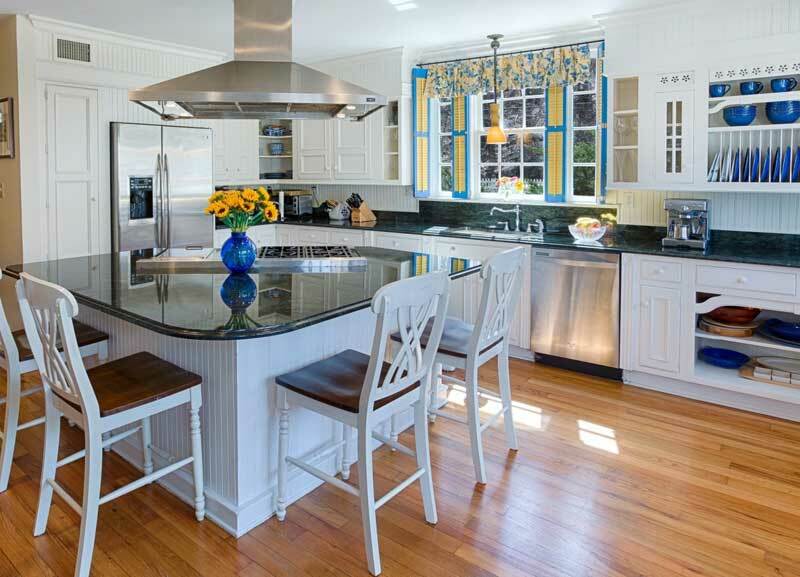 A white painted kitchen with colonial style cabinets and a granite countertop. The dark mist island includes a raised bar back. In addition to these, the light fixtures used here blend very well with the atmosphere making it a desirable place to cook in. 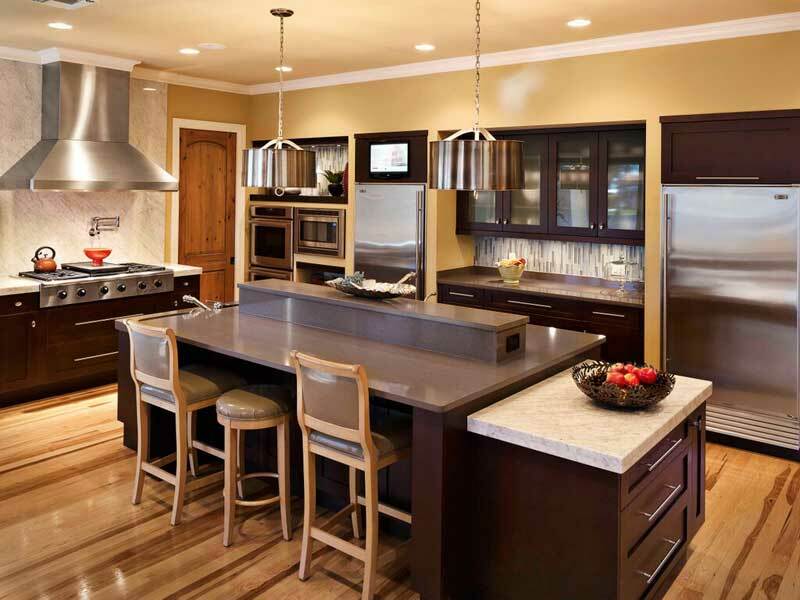 Transitional Kitchens incorporate components of both traditional and cutting-edge trends. Cutting edge in outline yet individual in nature, they regularly blend conventional and man-made materials and characteristic completions and surfaces. 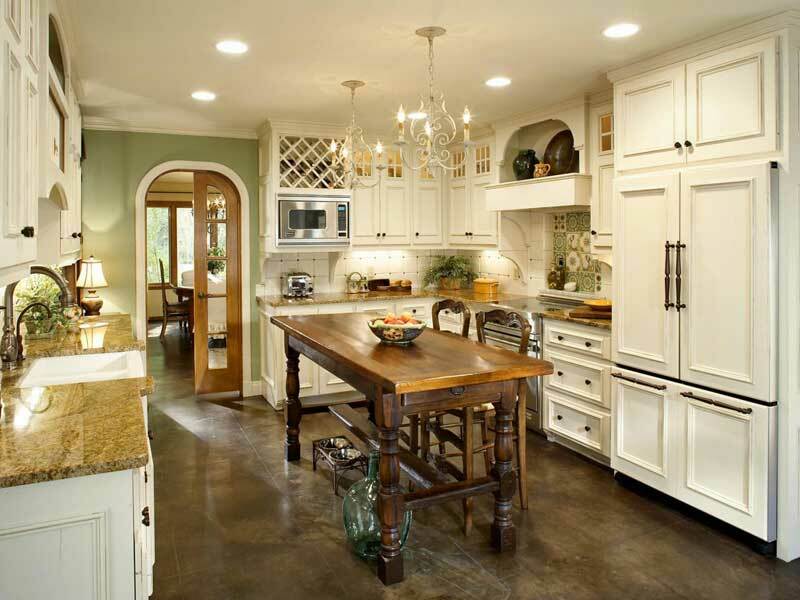 This kitchen is a perfect example of a transitional kitchen. The light neutral dove gray completion permits you to present more grounded walls and flooring tones into your outline plan and the lacquered finishing conveys the ideal polished look. 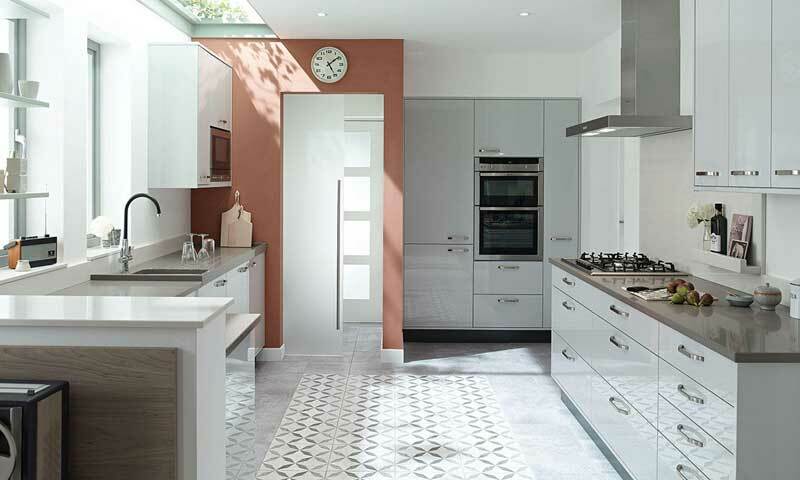 Dove Gray is accessible in a Matt finish that supplements an extensive variety of materials and completions. The pop of brick-red wall color adds a beautiful essence to the kitchen. 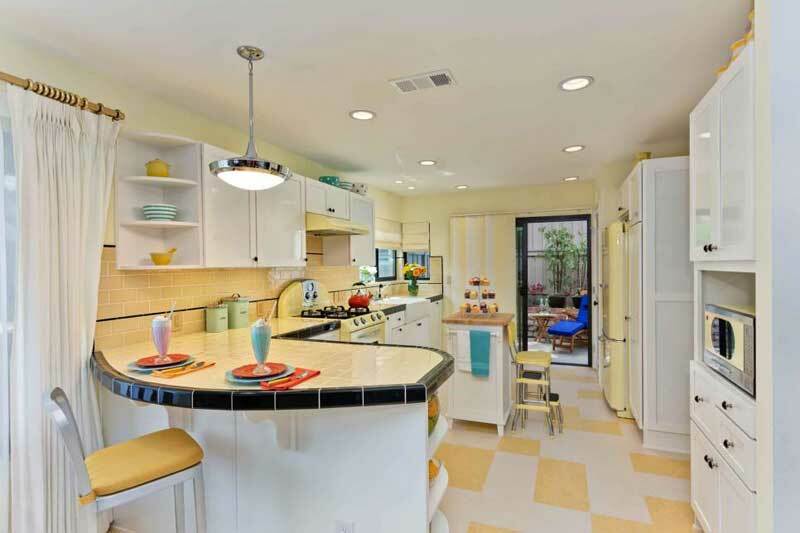 This retro style inspired kitchen is a fantastic original design. 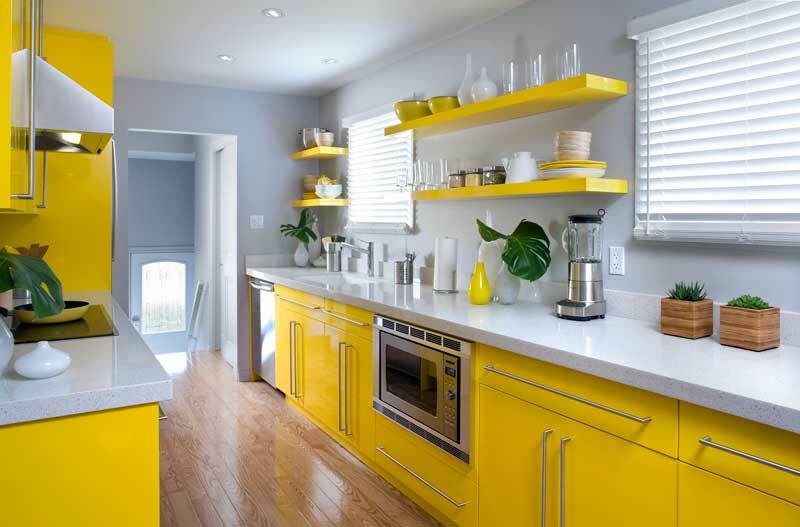 The highlights of yellow color bring that retro look to the kitchen and makes it look tacky. The use of whites has broken the flow of yellow in a great way. In the same manner, the chequered flooring pattern adds value to the true retro style. This kitchen summons such warmth in a delicate and effortless way. Brilliant golden light channels through the windows. One can picture a whole home that reflects both peace and tranquility. 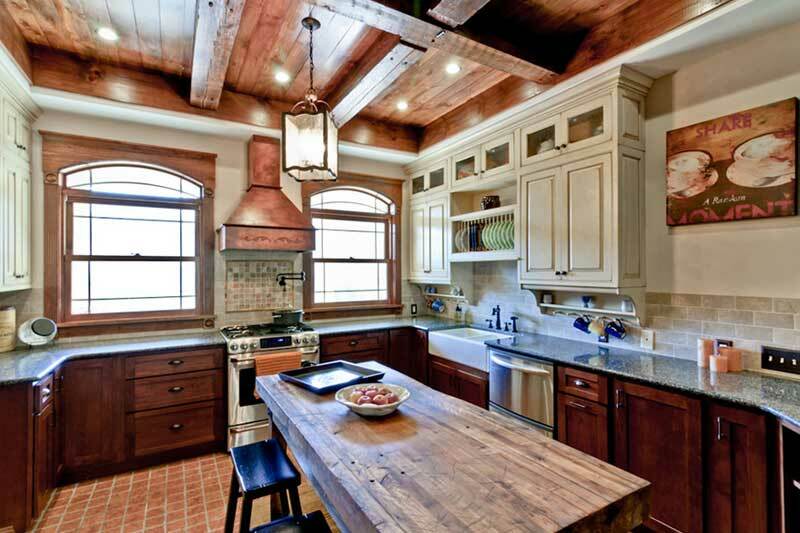 The beautiful granite top contrasts the brown color of the entire rustic kitchen. 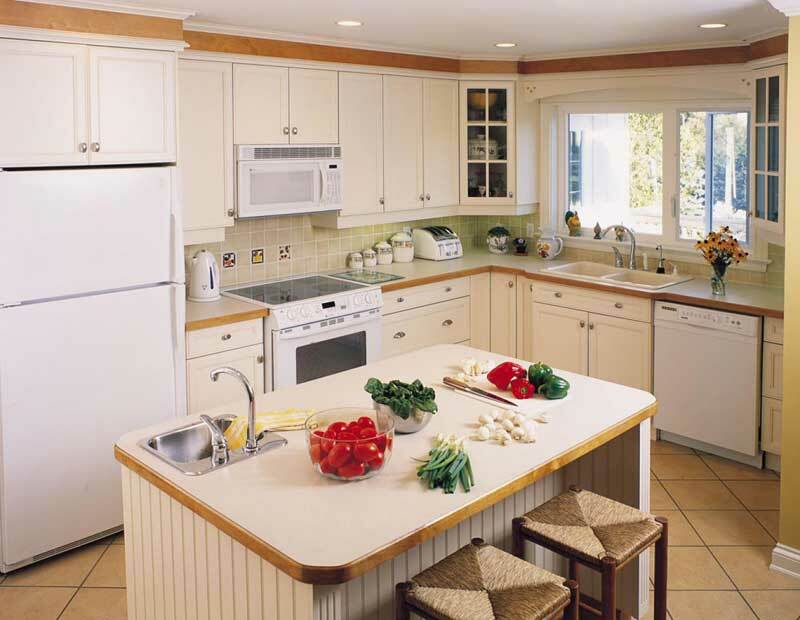 The shaker kitchen style tends towards traditionally proportioned entryways with a casing and inserts board. The Second Nature shaker kitchens utilize the best in cutting edge assembling and cover an assortment of materials and completions. From sparkle to woodgrain to painted, there’s certainly a fitting choice for your way of life and desired look. Here, the tongue and grooved panel is another great find for us that look phenomenal. The expensive bespoke island makes a fantastic point of convergence in this family inviting kitchen. The simple black pearl countertop with those white tongue and grooved panels make the kitchen look beautiful. The European style cabinets work best for the kitchen along with the contrast of the wooden floor which enhances the look of the kitchen. 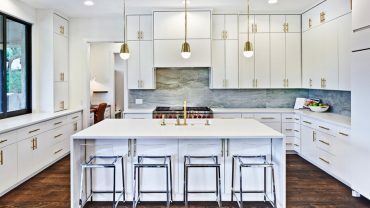 This example is an absolute inspiration for a small eclectic l-shaped eat-in kitchen with an integrated sink, shaker style island, beige cabinets, and wood countertops. Also, the dark beige ceramic backsplash, stainless steel faucets, and wooden finished square tiled floors are great additions as well. Perfect example for “More for less” kind of kitchens. When you have a space crunch, and you still want a modern looking kitchen, then you can use this design. With everyday natural wooden cabinets and island, the look is both rustic and modern. The use of easy wipe stainless steel at the cooking spot is a nice addition. This transitional style kitchen breaks the general assumption that goes along with plain white simple kitchens. Using many cutting-edge designs in high contrast stainless steel to make the kitchen look sophisticated. The hard wooden colored shaker style island and the hard wooden floor add an aesthetic look to this beautiful kitchen. 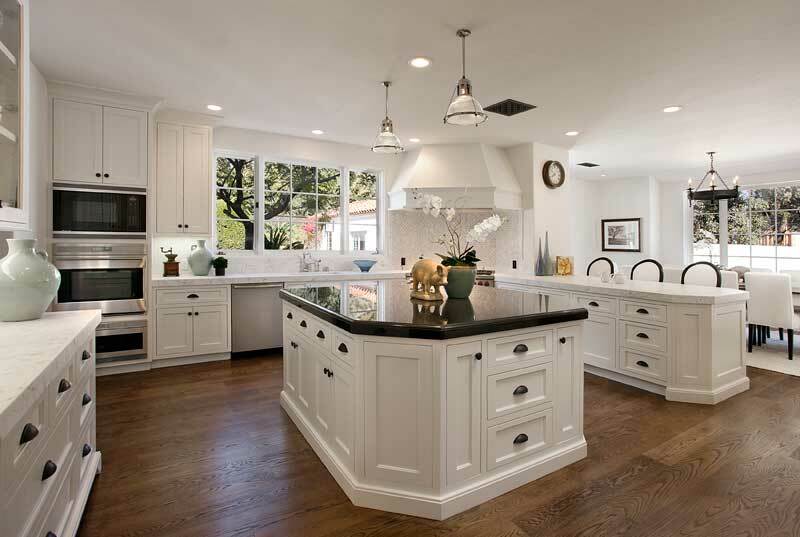 This traditionally styled kitchen has more to give with its traditional hood and cabinet designs. 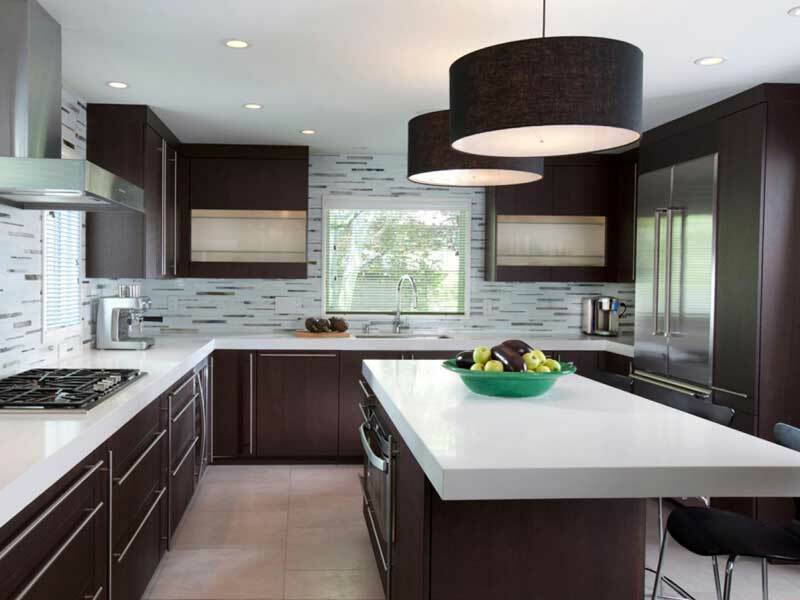 The use of contrasting a rosewood island and cream textured granite makes this kitchen desirable. The light fixtures are a great addition and add a dramatic effect. This green and white open-plan transitional kitchen, with a triangular island and white cupboards, freshly stands out from the brilliant green dividers in this bright openly arranged kitchen. A triangular island astutely boosts the space. The light fixtures used here complete the arrangement in an excellent manner. The tan colored roof, the orb chandelier, and the rustic looking candle stand are fantastic additions to this tropical styled kitchen. The designer white granite counter top and tan colored patterned backsplash enhance the beauty of this lovely kitchen. This simple u-shaped kitchen gives an idea of how to turn a boring kitchen style into an eye-catching place in any home. 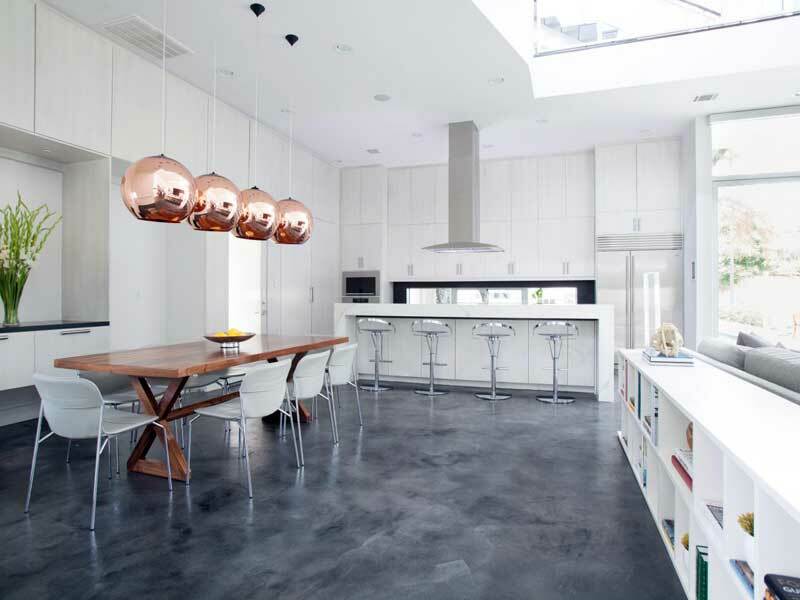 The pendant lights used here adds a dramatic effect to the kitchen which makes it look very welcoming. Also, the olive green backsplash tiles are a great pick. 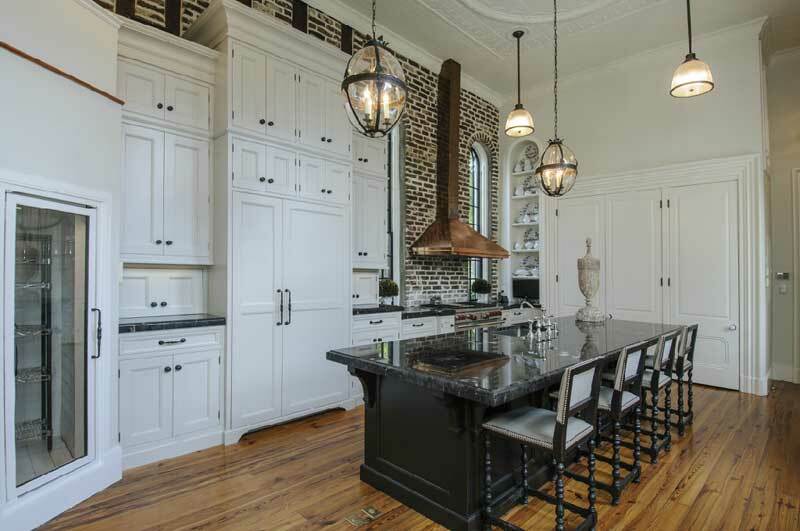 This traditionally designed kitchen is beautiful with its solid brick backsplash and high raised cabinets. The finished wooden hood and those orb lights give a character to the kitchen. The dark gray granite countertop completes the design. With all the white cabinets, the rosewood colored island will pop out well. 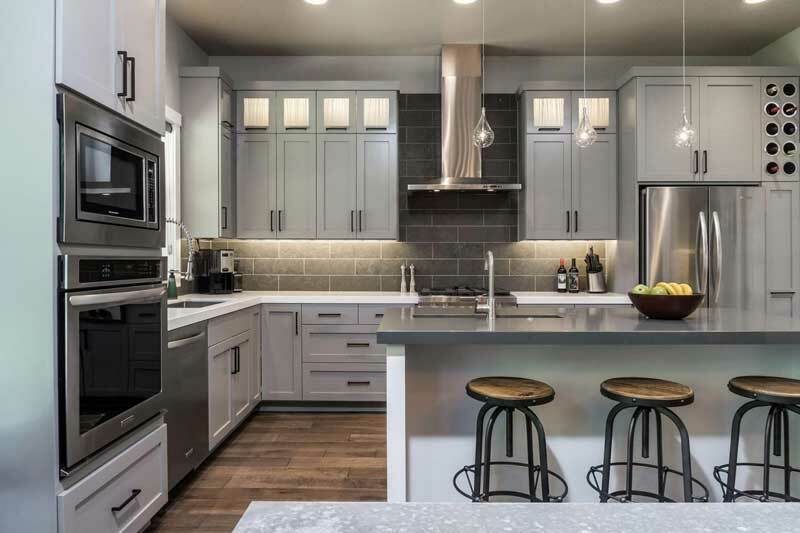 This contemporary kitchen with all grays and whites makes it an excellent example for those who are looking for kitchens with this color combination. The simple design of cabinet doors blends well with the walls and the hood hanging down from roof adds an essence to the kitchen. The dark gray floor complements the design very well. Homeowners choose gallery kitchens when there is limited space. 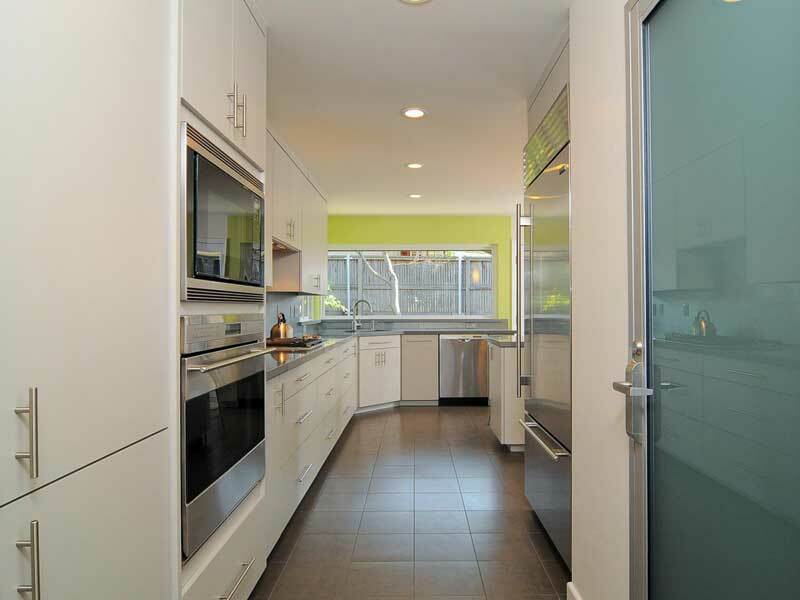 In this galley type kitchen, they have used white which reflects light and makes the area look expansive. To break the flow of white, they have added that beautiful light olive green highlight in one of the walls, and it works great. Strong, splendid and beautiful is all we can say about this bright kitchen- the yellow sparkle units are tempered by the stone surfaces to make a clean and modern look. The combination of white and yellow is creating a harmony to make this kitchen a warm and welcoming one. 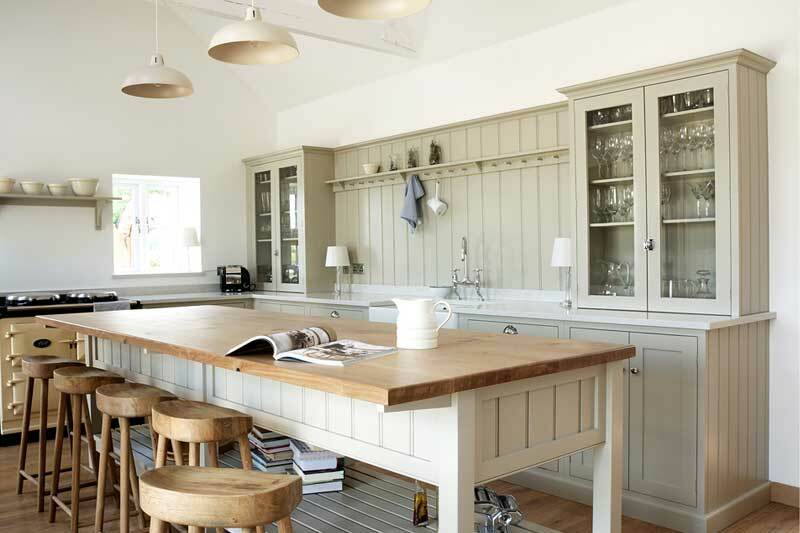 This great looking vintage kitchen is transformed in a great way which raised the scene to a new level. The rustic looking wooden cabinets are covered with fresh white paint, and the yellow chairs are redone to a modern looking desirable chairs. The new counter top gives an edge to the kitchen. 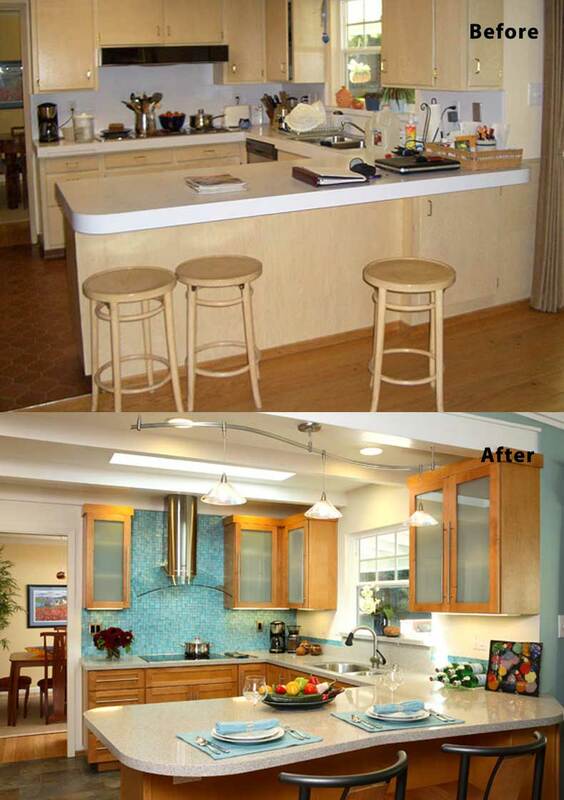 This kitchen has become a super kitchen because of its remodeling. 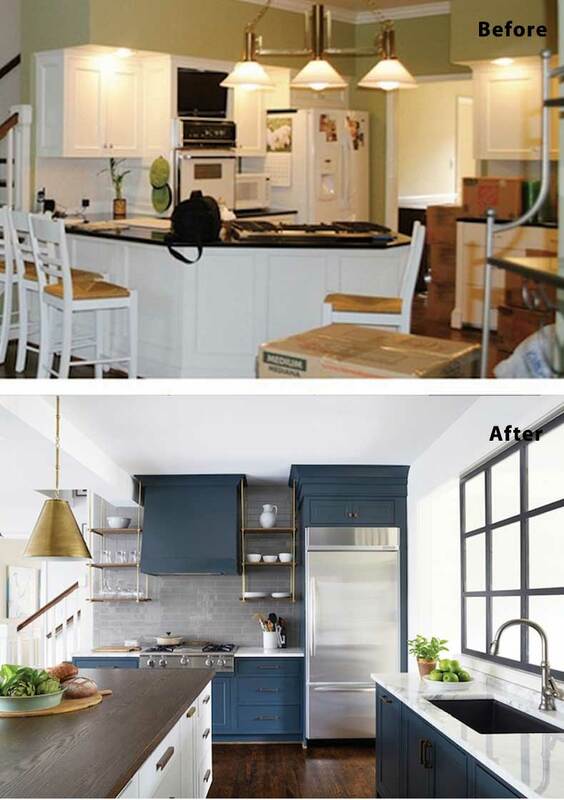 The use of navy blue color for the lower pantry and “Super White” everywhere else has changed the entire look of the kitchen. The satin brass is attention grabbing, and the faucets add just the right amount of warmth to the cool paint tones. With three countertops, the kitchen has enough space for everyday use. 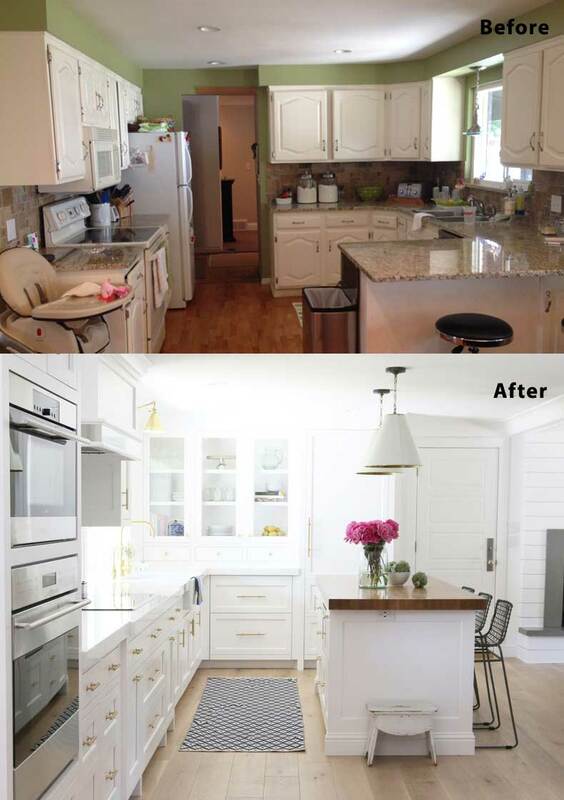 The transformation from a 70’s ranch style to this highly desirable design is commendable. 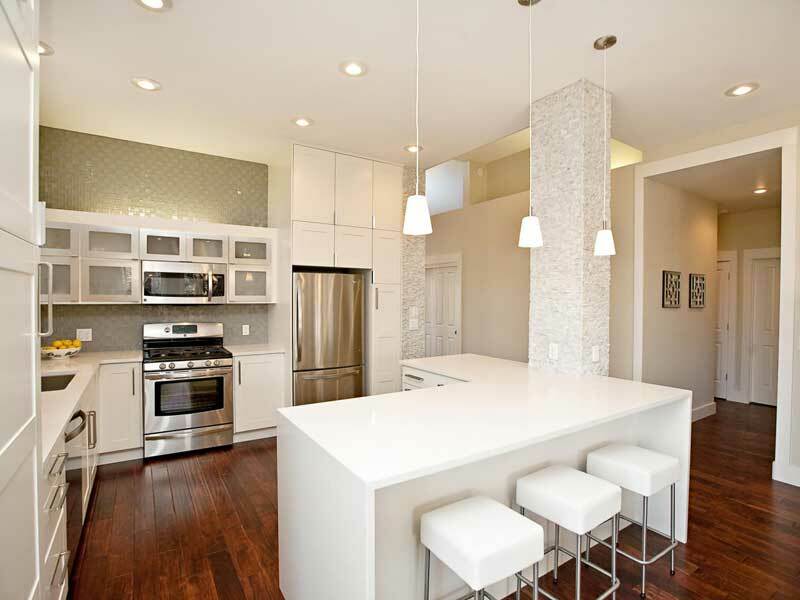 The usage of all whites gives a super spacious look along with contemporary style and design. Those polished stainless steel handles are a great addition. And the golden faucets adds a touch of elegance in the kitchen to create that luxurious aesthetic. With freshly painted cabinets, backsplash, floors, countertops, lights, sink, stools and faucets, everything here is remodeled and new. This is a good way to remodel a kitchen. They used a simple, mostly white, color scheme which brings a vastness to the arrangement which is only broken by the gray stools and stainless steel fridge. And the modern over headlamps make the design look more contemporary than the older ones before. From an everyday look to extraordinary look is all we can say about this transformation. The dark low lighted kitchen is now bright and full of light. They replaced the hood, counter top, lights and backsplash wall which do all the magic here. The new wooden stools complement the whiteness and are a nice touch. We love the changes here. 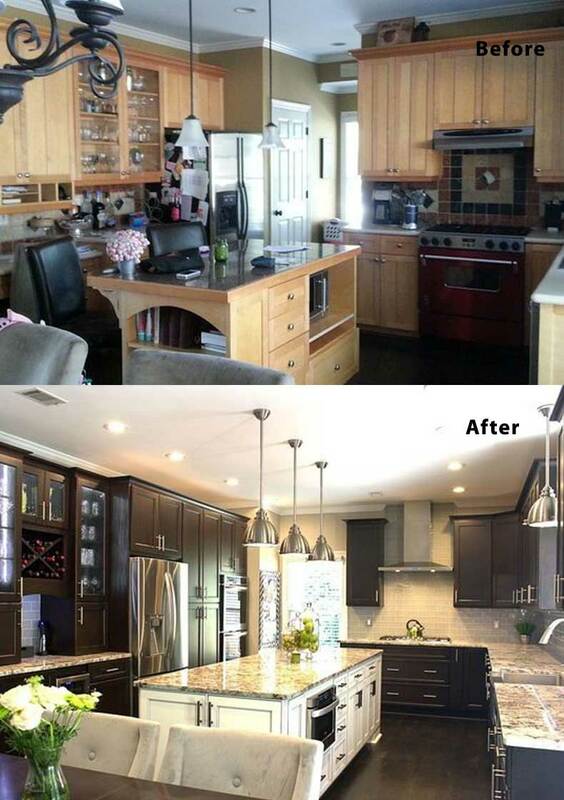 This traditional kitchen with a black counter top has gone through a serious remodeling. The dark blue cabinets are gorgeous and mysterious which adds a nice calm to the kitchen. The neat and square dark brown countertop blend magnificently well with the dark blue of the cabinets. The golden overhead lamp is tasteful and adds a nice touch to the whole arrangement. 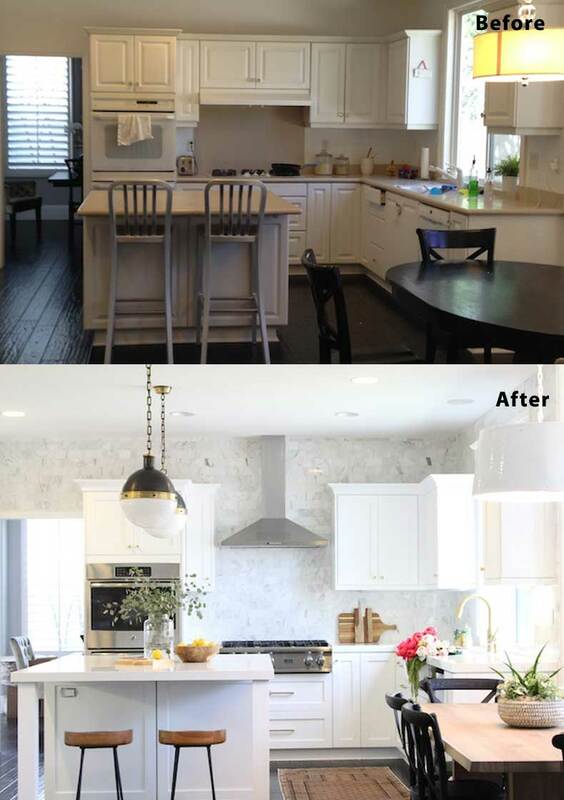 This vintage looking kitchen has gotten a good update with fresh glossy white paint, changed countertop, and a new backsplash. 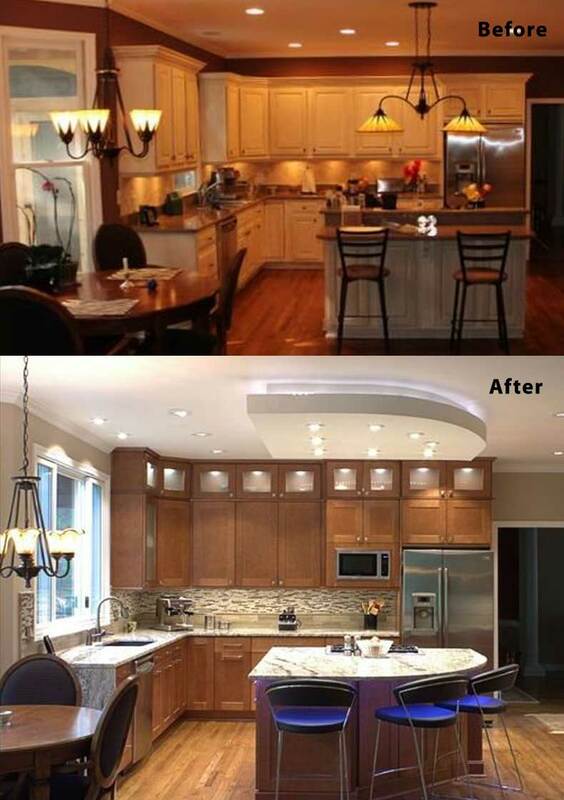 Though this is a budget kitchen remodeling, this has a great appeal and is more trendy than the previous incarnation. 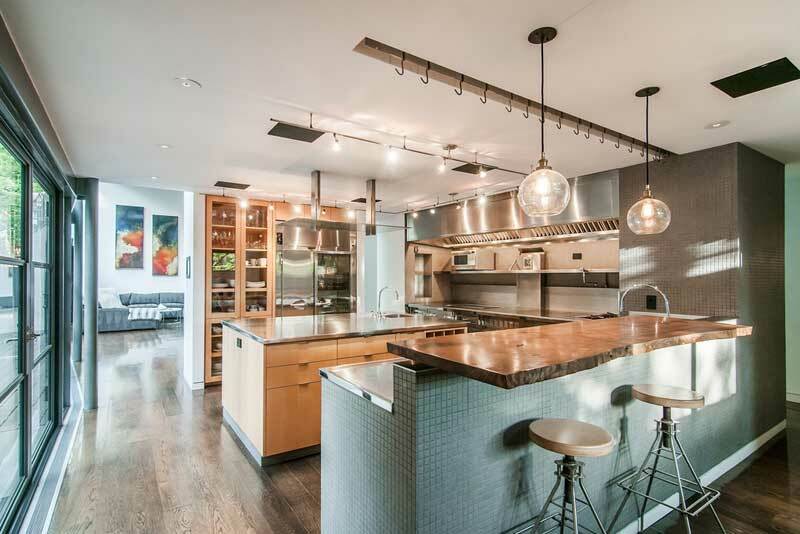 The entirety of the kitchen is very sleek spare the orb overhead lamps which contrasts the rest of the arrangement. With new contemporary styled black and white themed remodeling, these guys have hit the nail on the head. With the shiny cupboard doors and a simple square island, this kitchen now has got everything that a contemporary kitchen should have. The black and white color scheme is done magnificently, and the touches of stainless steel gorgeously complement it. 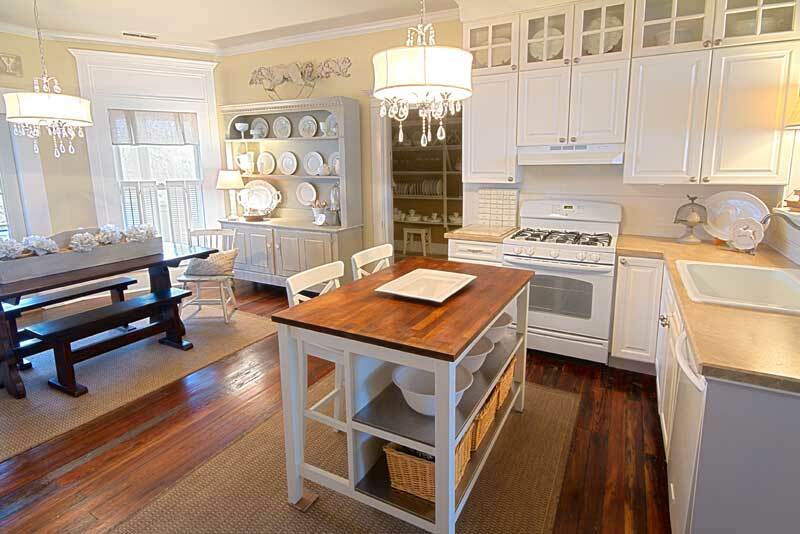 This light, bright kitchen is timeless, classic, warm and inviting. 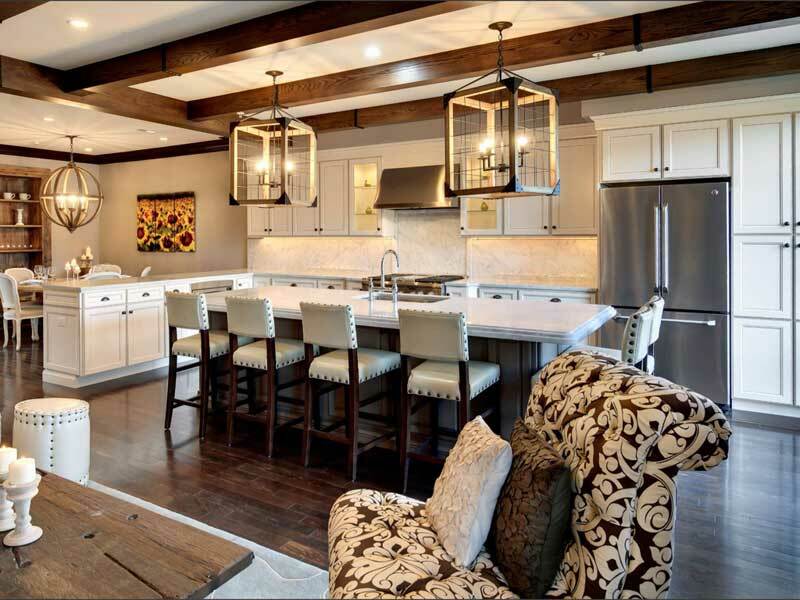 This beautiful kitchen gives a calm and uncluttered feeling with unique overhead lamps and simple wood chairs. The white paint and glossy texture on the custom made cabinets, stained cherry wood island, and the pleasant backsplash make this a sunny kitchen that anyone would love to have. 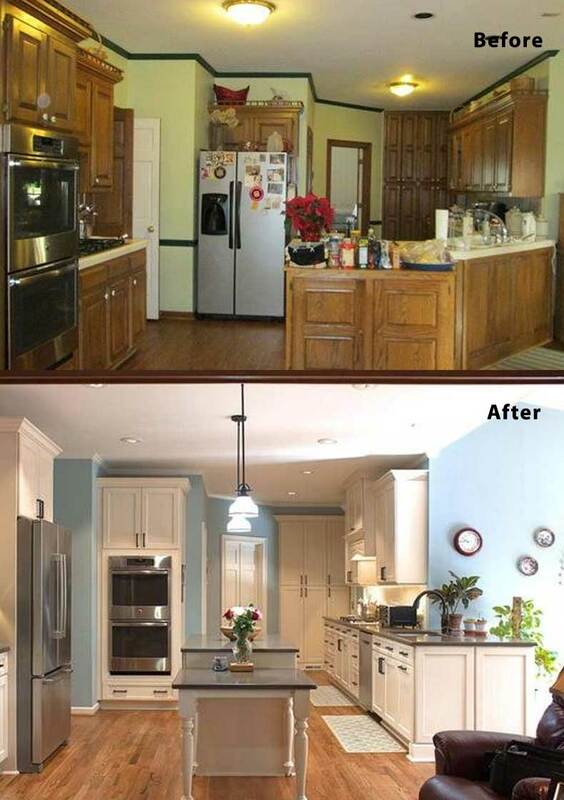 This is a great budget kitchen remodeling idea for you. It is sometimes so surprising at how little changes can affect the entire look and make it so loveable. The owner of this kitchen just changed the color combination of wall and cabinets from wood and white to the sleeker black and white. Look how beautiful and cozy it looks now. 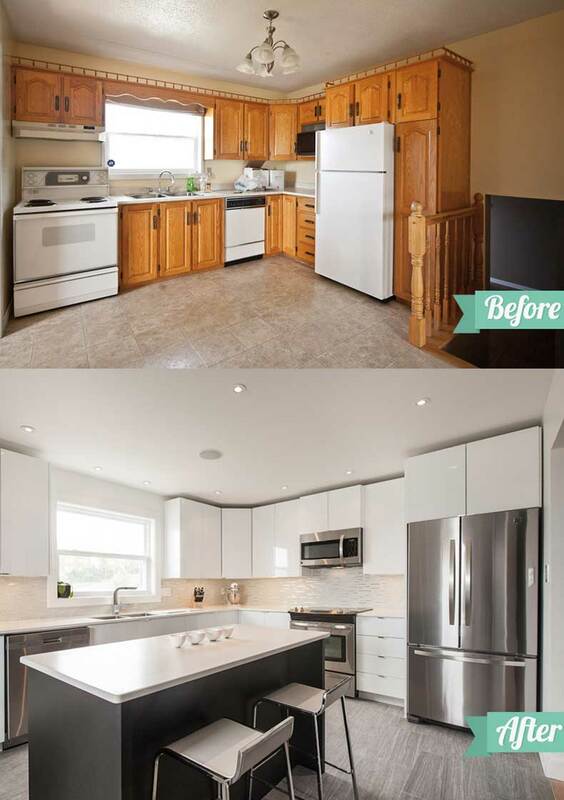 You can see that the before photo lacked space for the kitchen items and in after photo, all you can see is maximum storage space with a super stylish kitchen remodeling. 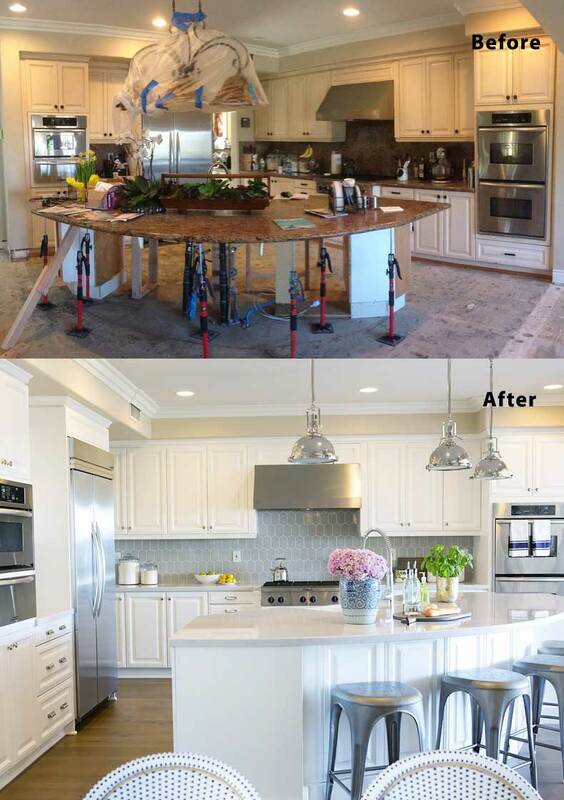 We love the way that kitchen is transformed and every detail of it. The black with white trim chairs and elegant orb overhead lamps are nice touches. This very low bright gaudy small kitchen has gone through a big remodeling. The dim lights have been replaced with brighter lights that fill the whole room up. The Light colored backsplash and cabinets add brightness to the arrangement as well. The upgraded wooden island is as spacious as the kitchen looks now. This white kitchen has reversed the trend, which is a very bold move. The mahogany colored cabinets with a new counter top and triangle shaped island give a new rustic look with full functionality. The cool blue chairs add a bit of pop to the whole arrangement making it look fun. 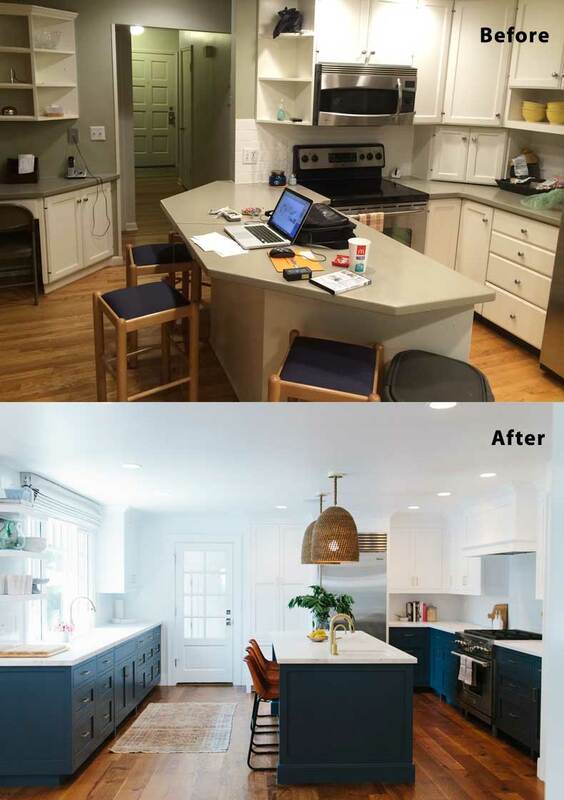 This is one of best budget kitchen remodelings I’ve seen. 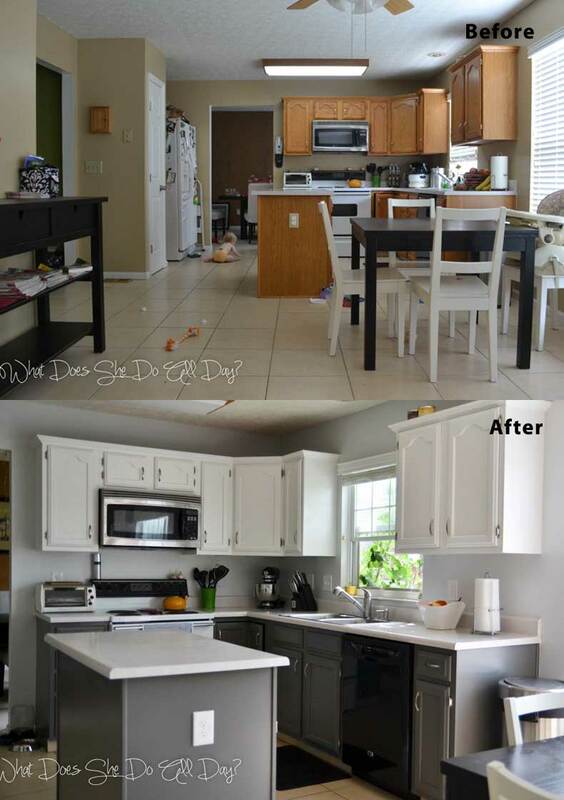 The before picture is a kitchen with no proper shape and has haphazardly placed units. It has been remodeled to a kitchen with highly sophisticated looks. They have added a new island with sufficient space and a good amount of storage units that makes it a super functional kitchen. The embellishment in the backsplash is an eye catcher. 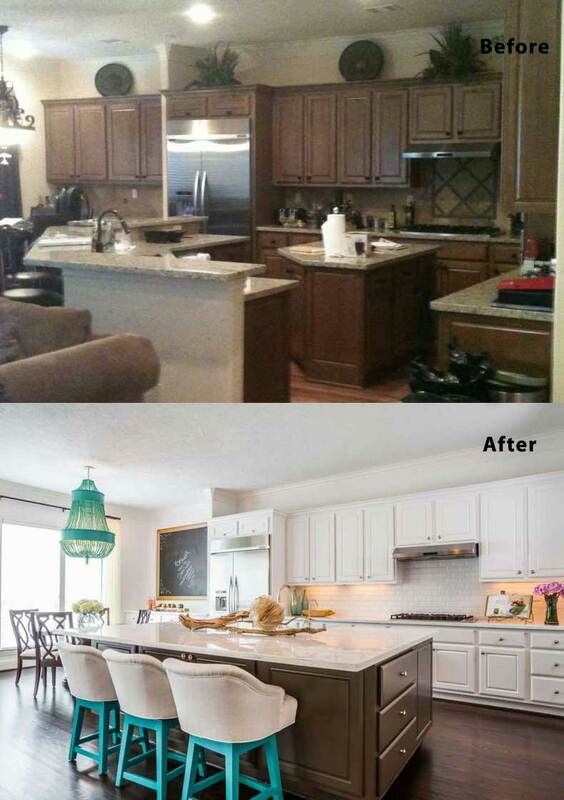 By ditching those all white look and incorporating a beige-tan color combination, this kitchen has been remodeled to a great extent. The new lights make the whole kitchen shine. Also, the change from a wooden countertop to a granite one and a new trendy hood and with a good amount of storage space make this kitchen look excellent. This vintage styled kitchen is all prepped up with a nice warm family friendly look. The customized hood is an eyepiece itself and attracts anyone who visits this kitchen for the first time. 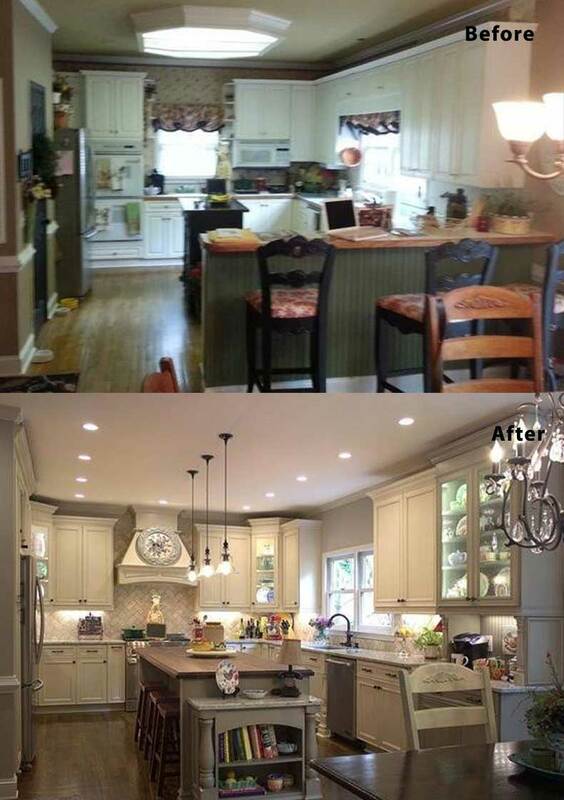 The sober color combination gives a warm look to the place, and the light fixtures add drama to the kitchen. 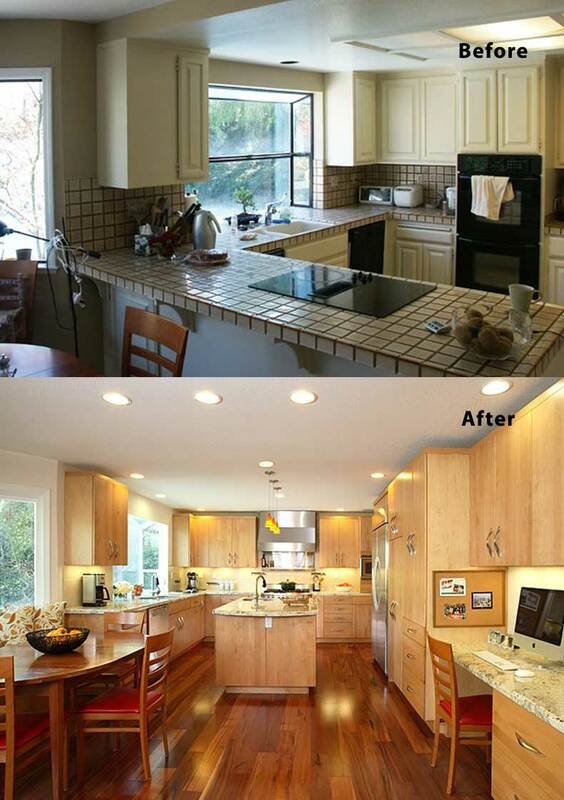 This compact kitchen has been remodeled to be a desirable sophisticated kitchen. With the black and white theme, the designers have hit the nail in balancing the colors. 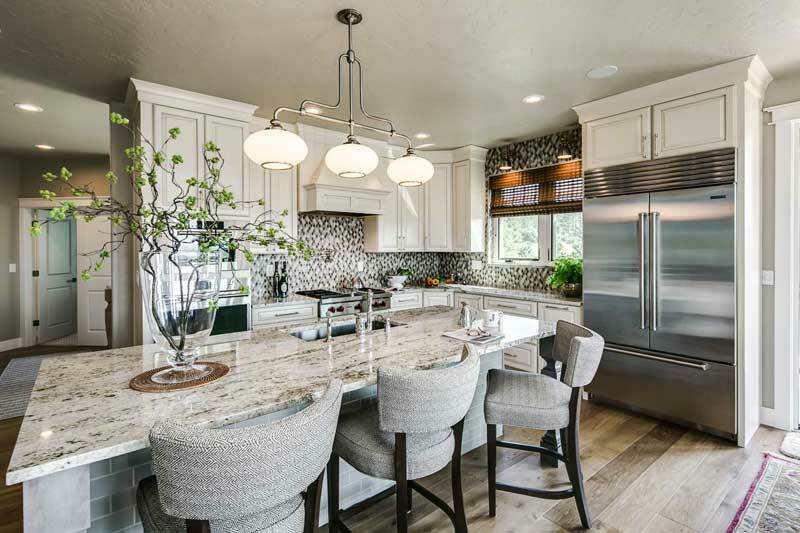 The long and spacious island and the granite counter top give that classy look. The light fixtures used here blend very well with the decor. 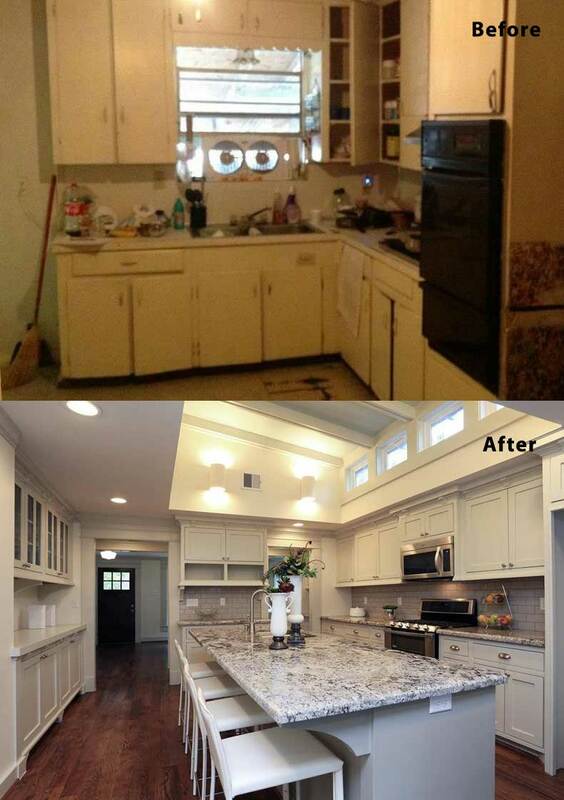 This small kitchen, with no easy space for movement, has been remodeled to a clean white and spacious looking kitchen. We love the gray counter top which blends so well with the new design. 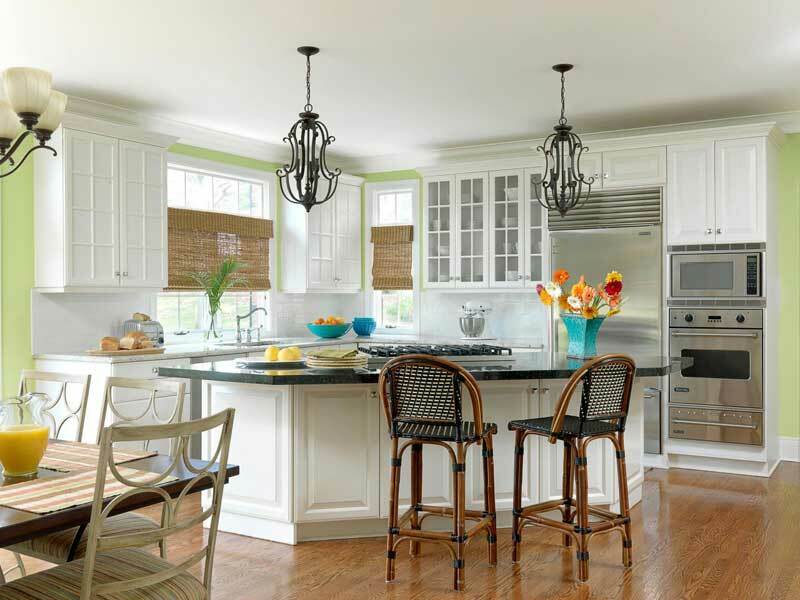 The light fixtures also add a new dimension to the kitchen making it more bright and inviting. This ordinary looking kitchen has been remodeled to be an excellent looking kitchen with an openness which in turn gives the kitchen a natural flow. 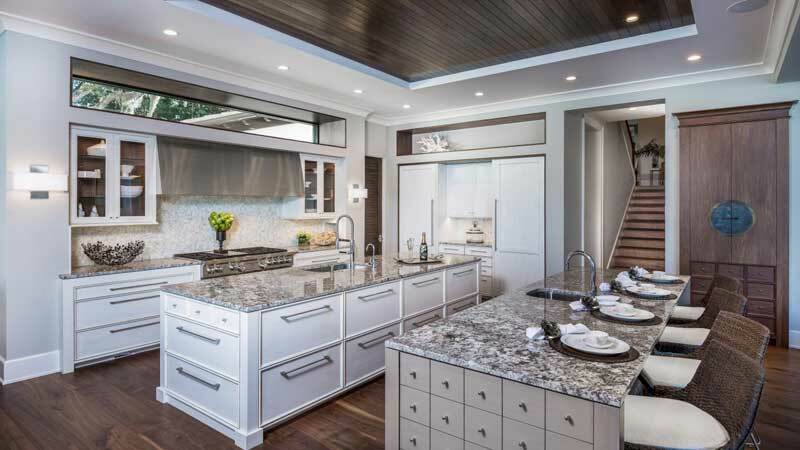 The granite top of the island is itself an eye catcher. Along with those beautiful light fixtures which add a real bit of drama to the kitchen. 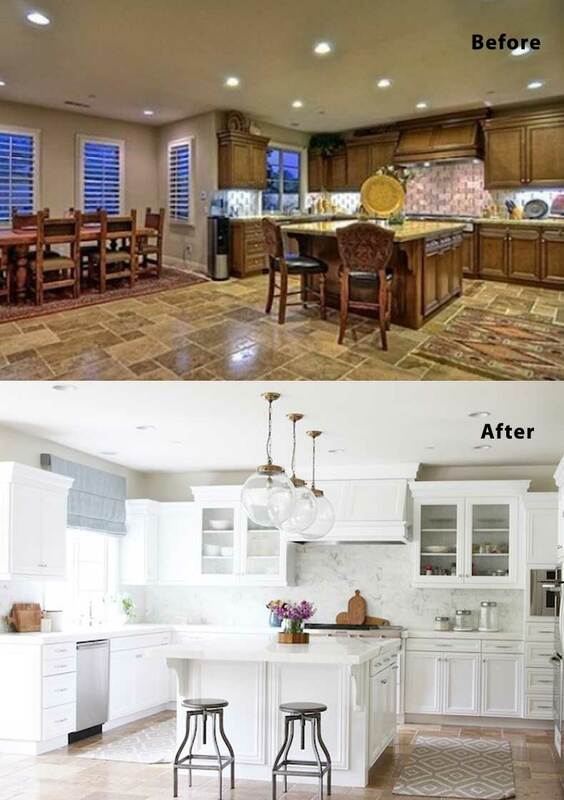 This not so great looking kitchen has been converted to a wow looking kitchen by adding those new valued additions like the countertops and island. That bit of blue in the leg of chairs pops out very well, and it gives the kitchen an expensive and sophisticated look. Seriously? Is this the same kitchen? Yes, it is! 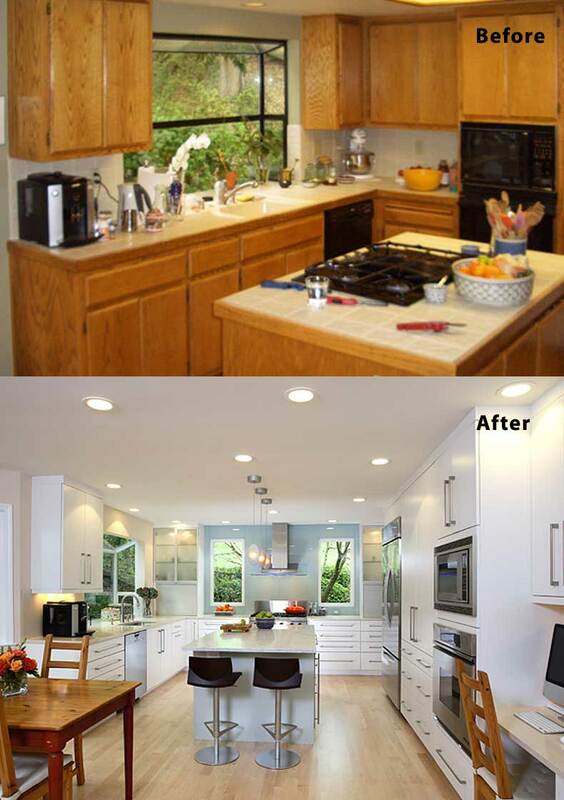 This is how a kitchen remodeling should work, with new kitchen practically being a new place. With the beautiful granite countertop, white cupboards, and a very spacious island, every inch of this new kitchen is beautiful, and the kitchen as a whole is super functional. This old looking apartment kitchen is all prepped up with beauty to surprise everyone. The beautifully textured countertop is an awesome replacement, and the glass finished hood gives an essence of sophistication. The cupboards with glass doors are a beautiful design which is super functional and looks awesome. 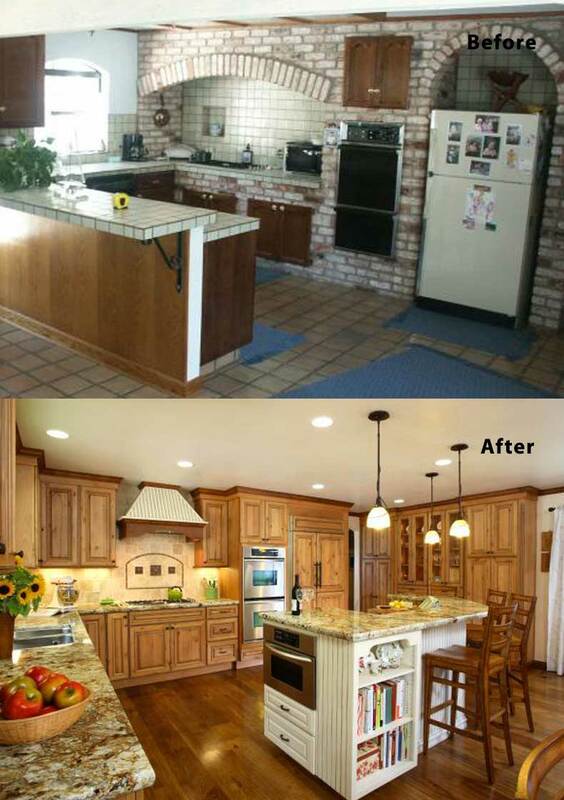 This old barn kitchen has been updated to be a classy kitchen with all finished wooden cabinets. The textured granite enhances the environment by adding warmth. The curved island is a beautiful idea which saves lots of space giving the area a new look. The kitchen has a ton of utility with an abundance of storage space, including a bookshelf for cookbooks. This average looking apartment has gone through a serious contemporary makeover. Every bit of this new kitchen is spectacular and desirable. Be it the countertop, white colored cabinets, the light fixtures, or that shiny top island. That blue wall brings out the serenity of the whole kitchen. 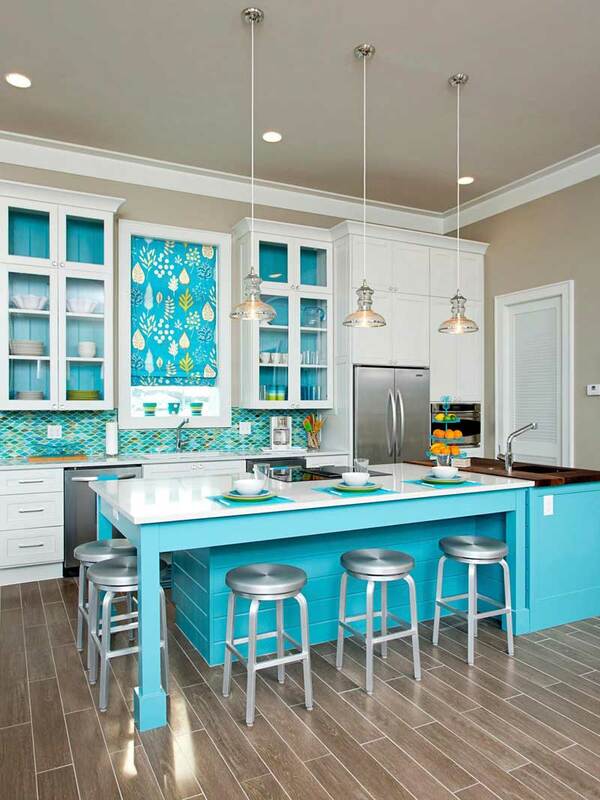 This all beige colored kitchen has got a colorful remodeling by adding that electric blue colored backsplash. The rounded countertop and the glass hood add an essence of luxury to the kitchen. 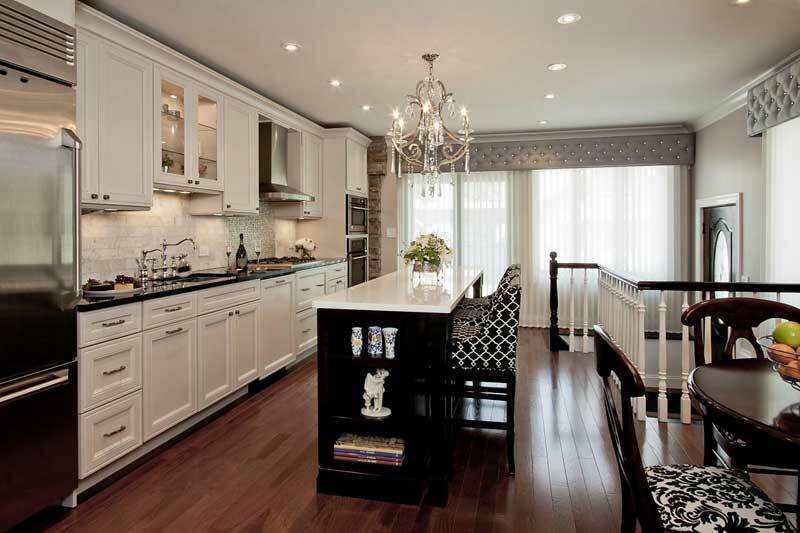 Sleek maple cabinets with frosted glass doors blend so well with the design. The Quartz countertop and slate floor create a sense of warm modernity. 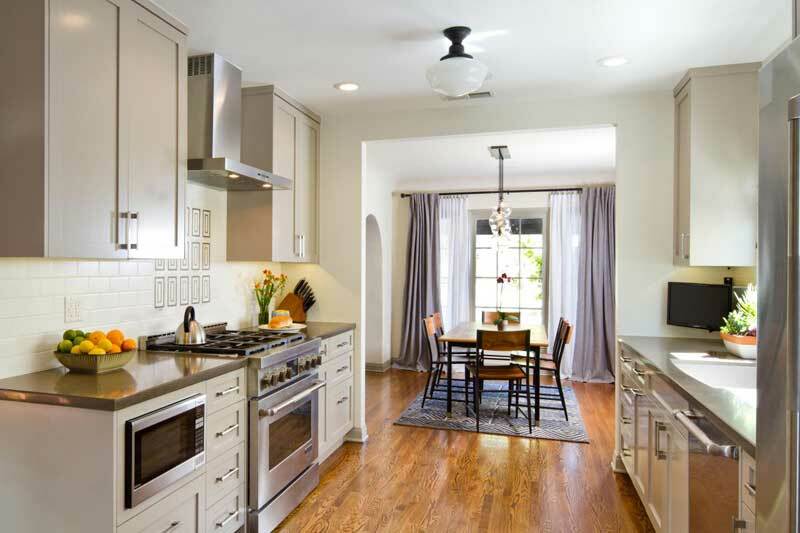 With lots of space available, the remodeled kitchen looks trendy and inviting. The new island with prep sink and tall cupboards are great additions. The openness of the new format is perfectly in line with the maple cupboards and smooth granite countertop. The new comfortable seat by the window gives extra storage space. The rounded hood with little storage space is an eye catcher.